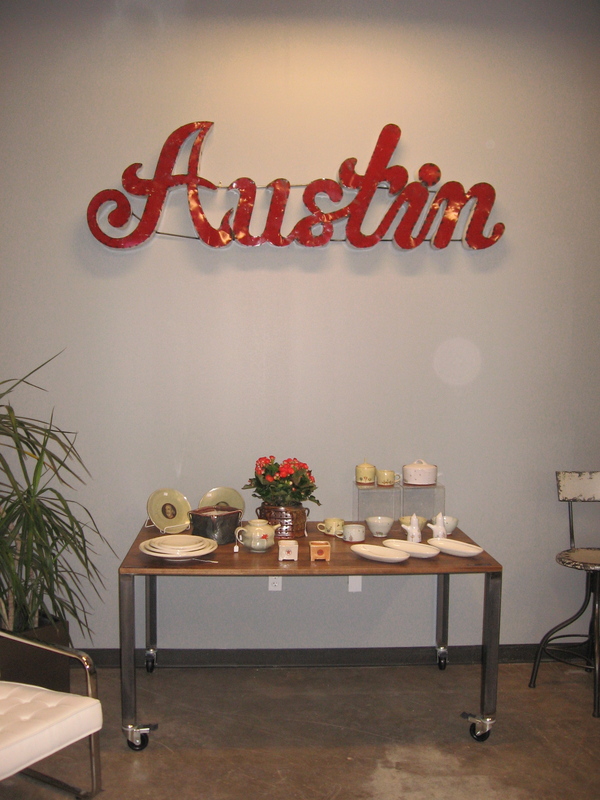 The always awesome Art of the Pot in Austin, TX is coming up this Mother’s Day weekend in May 2014. Leading up to the next studio tour I have a whole slew of photos from last year’s event, so I’m going to split them up into two installments. We usually start at Ryan McKerley‘s studio. He’s such an awesome potter and a wonderful person to boot. I have fired my pots in his kiln a few times, which definitely numbers among the highlights in terms of my experiences in the pottery community. One Ryan’s large jars with the trademark Pac Man knob. 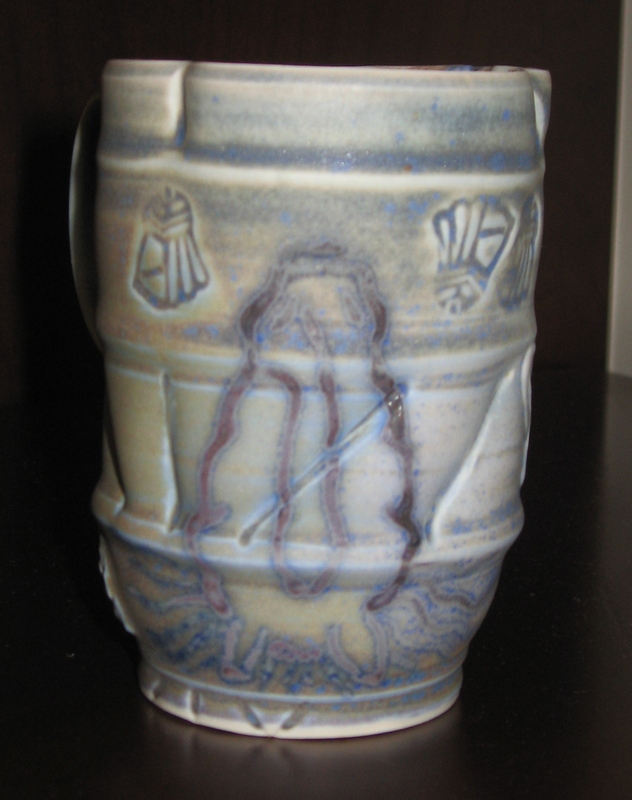 Soda firing is my favorite firing method and Ryan’s surfaces are akin to what I strive for in my own work. Flower brick by Joan Bruneau. 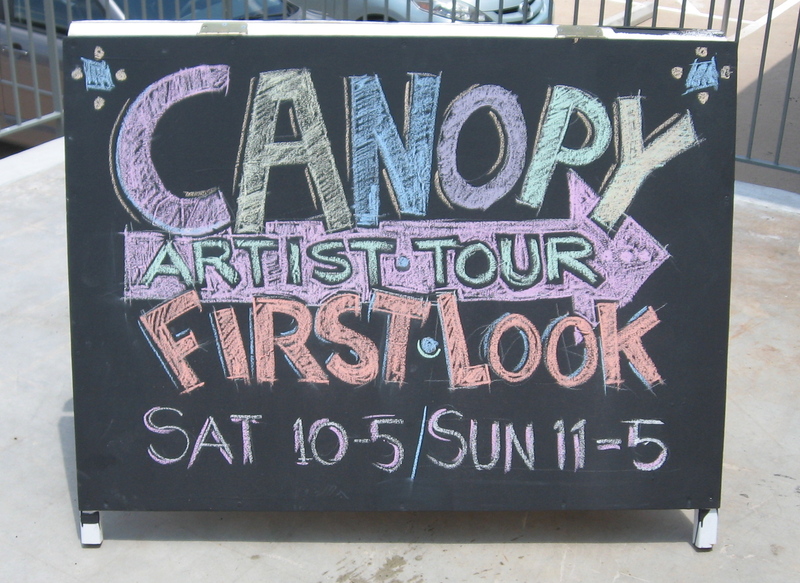 A few invited artists share each host studio. Joan Bruneau of Novia Scotia presented her gorgeous terra cotta pots alongside Ryan McKerley, Chris Campbell, and Bryan Hopkins. 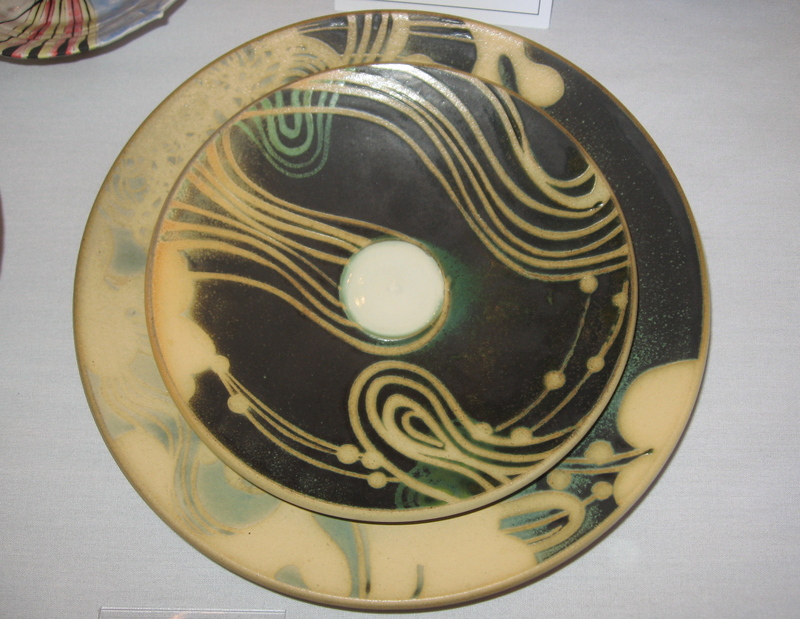 Lovely plates by Joan Bruneau. The brilliant glaze colors coupled with the rich red clay body makes for a highly covetable pot. 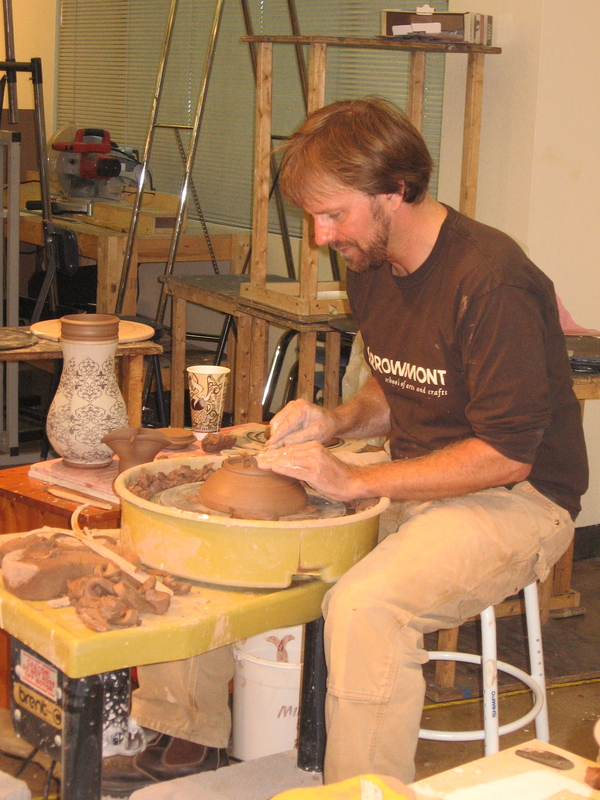 Ryan McKerley shares his studio with fellow host Chris Campbell, who wood fires his dark stoneware clay pots. Porcelain ware by Bryan Hopkins. Thin, translucent porcelain abounds in Bryan Hopkins‘ work, often textured with carving and mundane objects like wood planks or diamond-patterned steel sheets. Saying farewell to the mural on Ryan’s studio exterior for another year. A different studio tour happening concurrently in the building housing Keith Kreeger’s studio. Photographers, painters, and other 3-D artists presented work in the other studios adjacent to the next AotP host potter. The entrance to Keith’s studio. 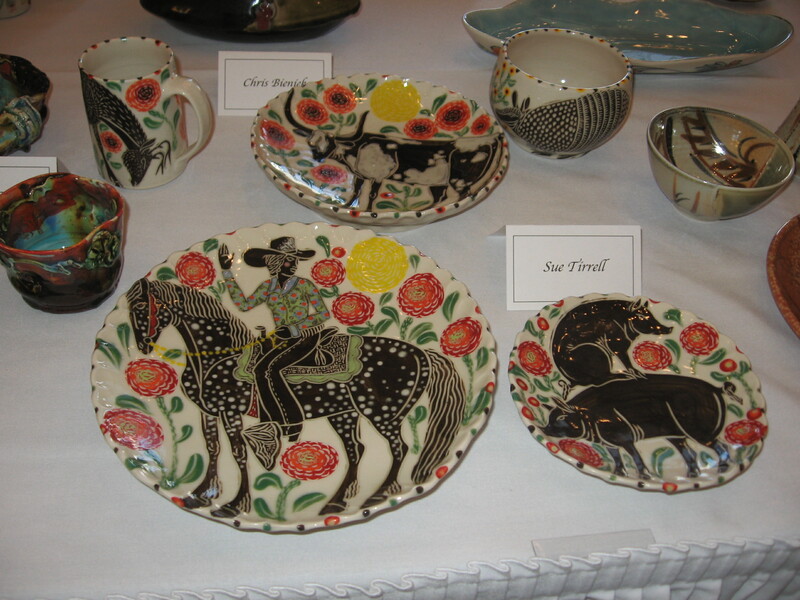 An array of pots from all of the presenting artists within decorate the table. 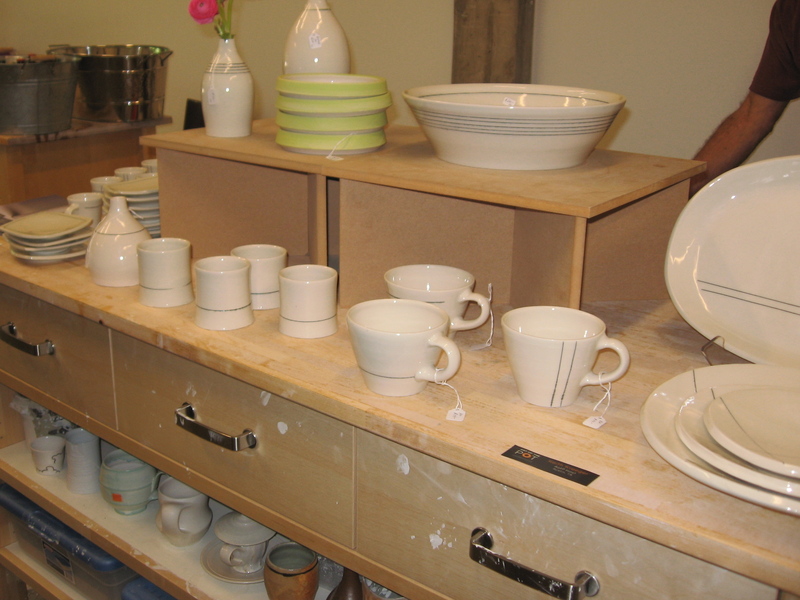 Host artist Keith Kreeger produces minimal, sometimes softly colored, functional pottery. 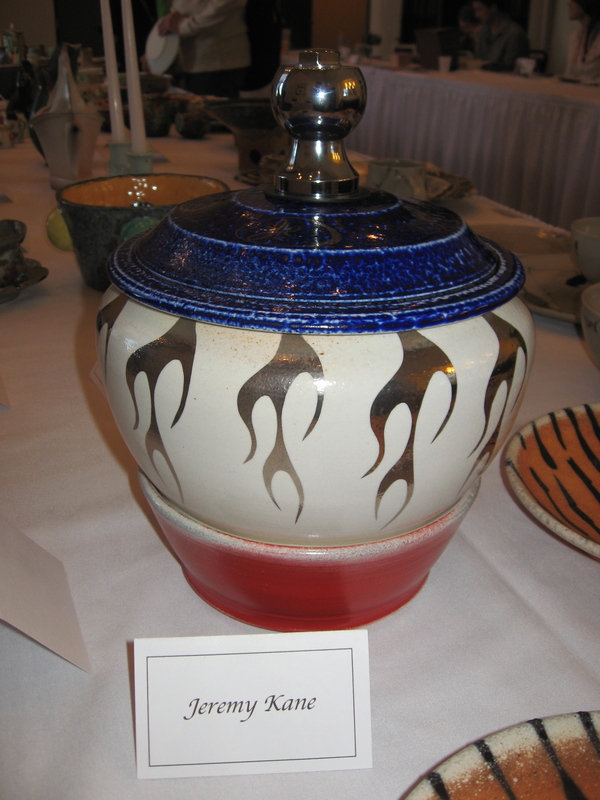 Some of the more colorful Kreeger pots. There’s always something new in Keith’s array of pots, so I look forward to seeing the latest and greatest each time I enter his studio. 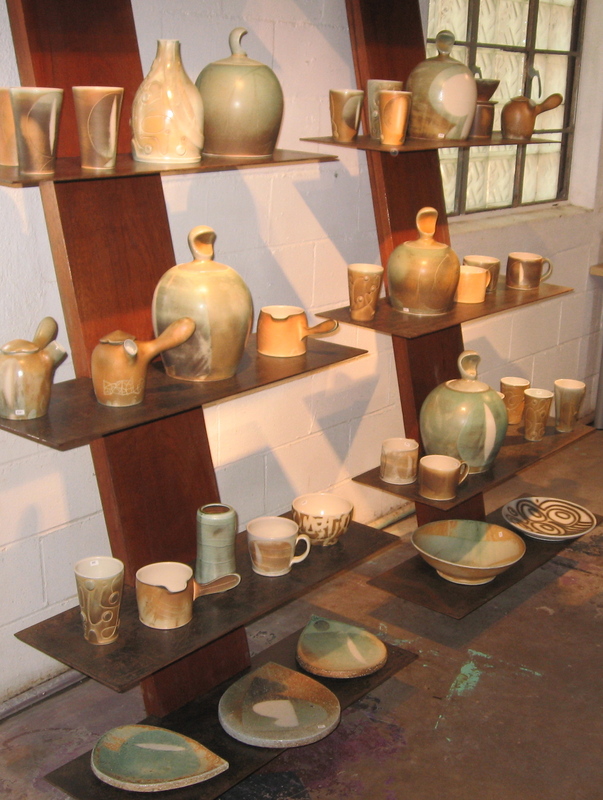 Another assortment of pots from the potters in Keith’s studio. I love to see different work shown alongside each other, the variety makes for a strong and visually appealing presentation. Decal encrusted pots by invited artist Dan Anderson appear at top left and bottom right. I loved the clean forms augmented with brightly colored surfaces from invited potter Courtney Murphy. Especially this cream and sugar set! The arched line of raw clay on the sugar jar made me swoon. Two more studios to come, stay tuned for photos! 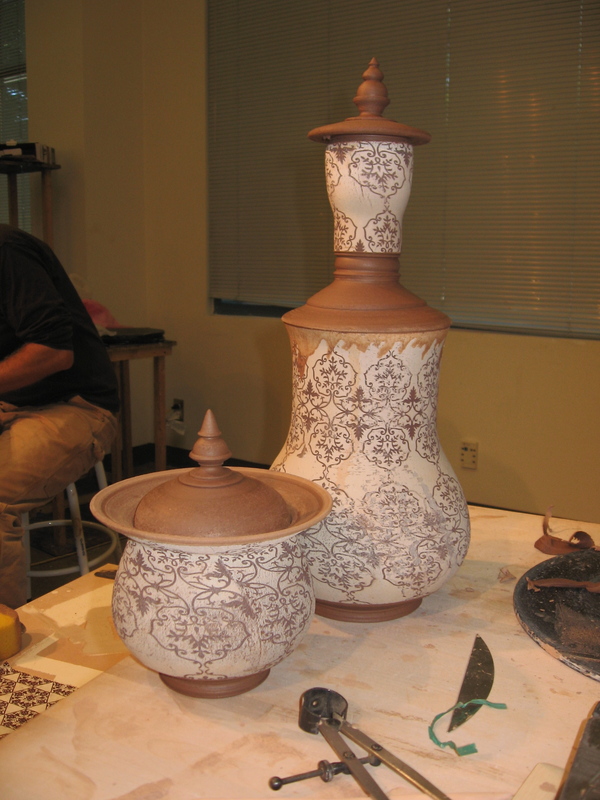 The Craft Guild of Dallas typically hosts 2 visiting artist workshops annually in the clay department. 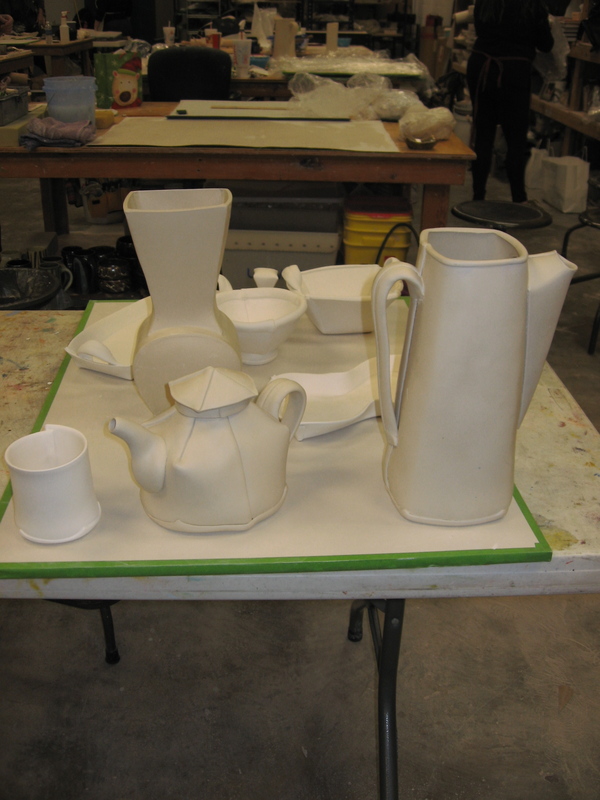 This year the first visiting artist workshop featured porcelain slab building with Margaret Bohls, who teaches at the University of Nebraska Lincoln alongside Eddie Dominguez and Pete Pinnell. I have been darting a lot of my thrown pots and trying to troubleshoot hand-building for such forms as oblong butter dishes and irregular shaped trays so I jumped at the chance to learn some practical techniques regarding how to execute said forms. Some of Margaret’s paper templates. 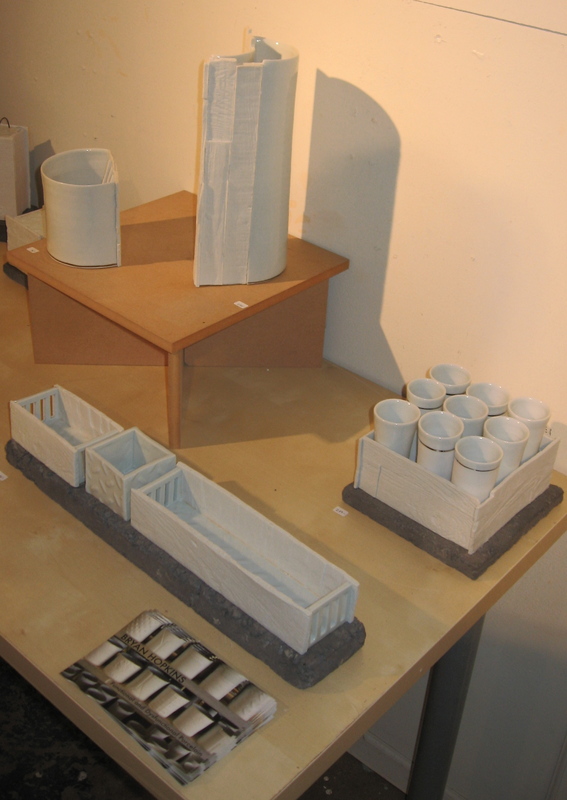 To regularize her forms and maintain clean, straight seam-lines Margaret employs the use of paper templates based on squares or cylinders. 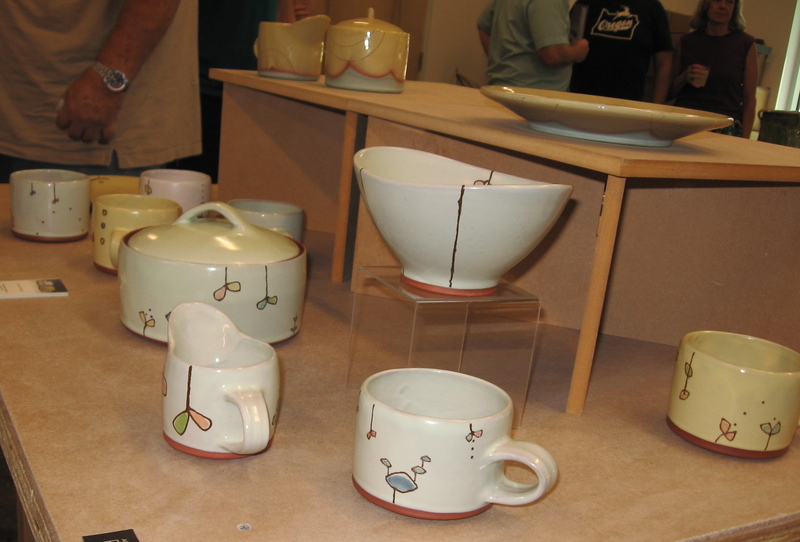 Shown above are mostly bowl patterns. These are square-based with curved edges, and she usually drapes them over round slumps then adds a folded-over slab rim and flattened jelly roll for the foot ring. 2 days worth of demo pots. Everything you see above was created with darted slabs, except for the vase which utilizes leather hard slabs joined together. 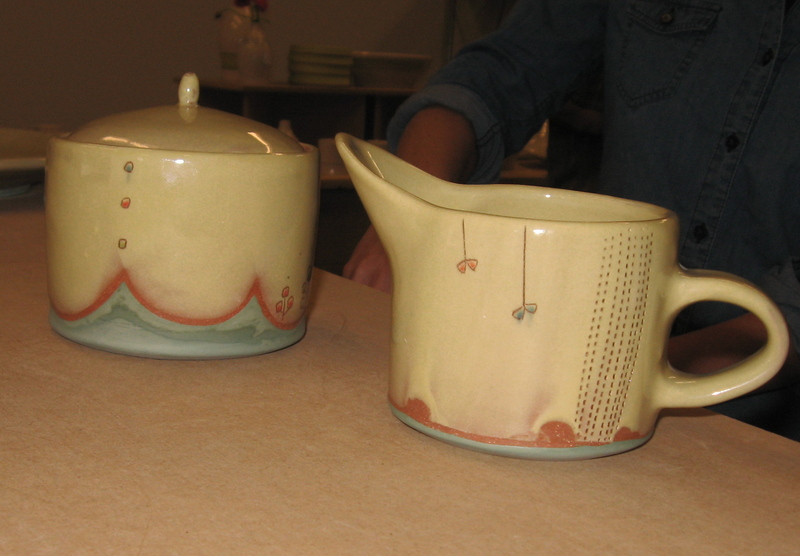 The pitcher spout has a squared off v-shape template, while the teapot spout template resembles a whale tale, as Margaret pointed out. The handles are created by rolling slabs up like a jelly roll, then slapping them on a work surface that is slightly moistened to flatten to the desired handle shape. Note: flatten with the seam-line up or you’ll smoosh the seam out of existence! They are surprisingly beautiful whether as a lug handle on a tray or more stretched out on a taller form. 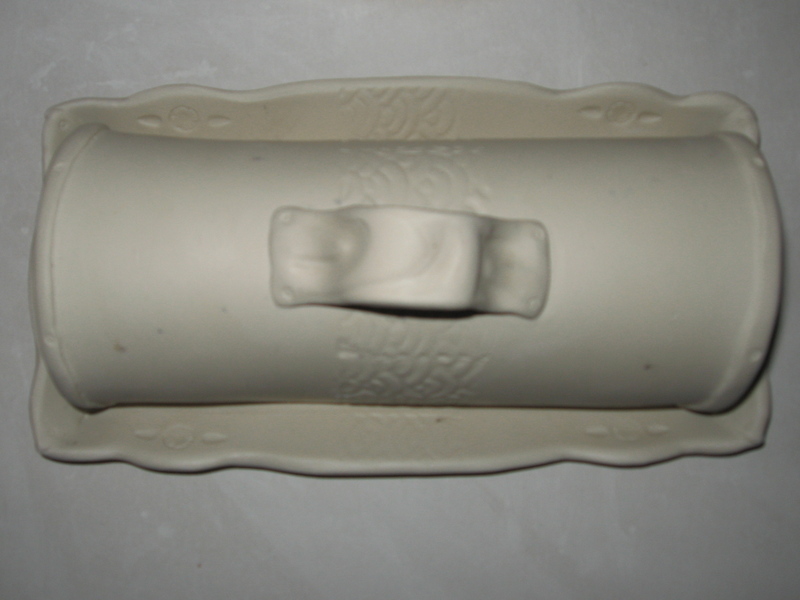 The back center bowl features the jelly roll handle as a foot ring, instead. Margaret credits Lana Wilson with showing her the jelly roll handle technique originally. For darted slab pots all edge and lip treatments must be done on the flat slab before assembly when it’s about 1/2-way between freshly rolled out and leather hard. Be careful to rib both sides of the slab often during working them and you may wish to stretch and thin the slab prior to cutting out the template. Shape the lip before cutting out the darts or cracks will form in the corners as you manipulate it. Seams are created by overlapping the edges so thin and smooth the edges of the darts accordingly. Scoring and slipping is recommended, followed by carefully pressing the seams together until well-stuck without running your finger over the edges themselves. You can go back in with a sponge and fingernail combo to clean up the seam when it’s closer to leather hard, so don’t worry about little imperfections or you might overwork or damage the edge. Margaret typically cuts out the base after the walls are assembled by simply tracing around the base of the pot on a slab, then carefully pressing the edges up onto the wall with long, smoothing thumb strokes. 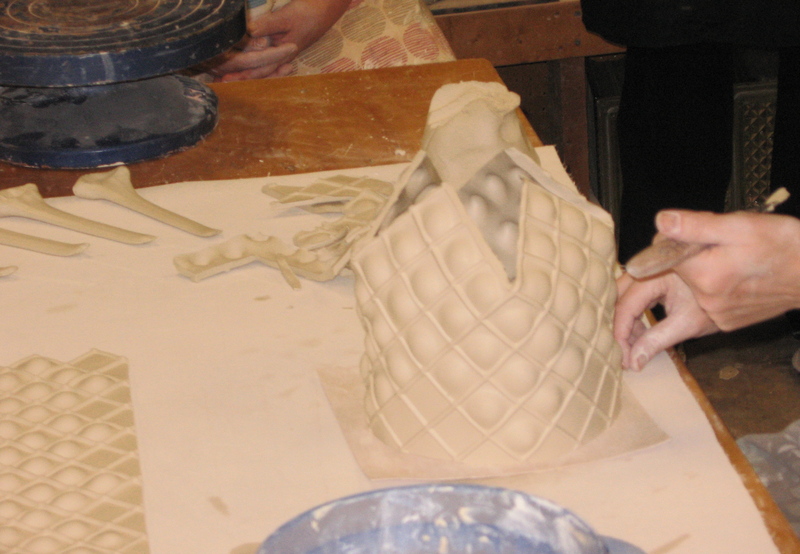 Working with a textured slab to create what Margaret calls bumpy ware. 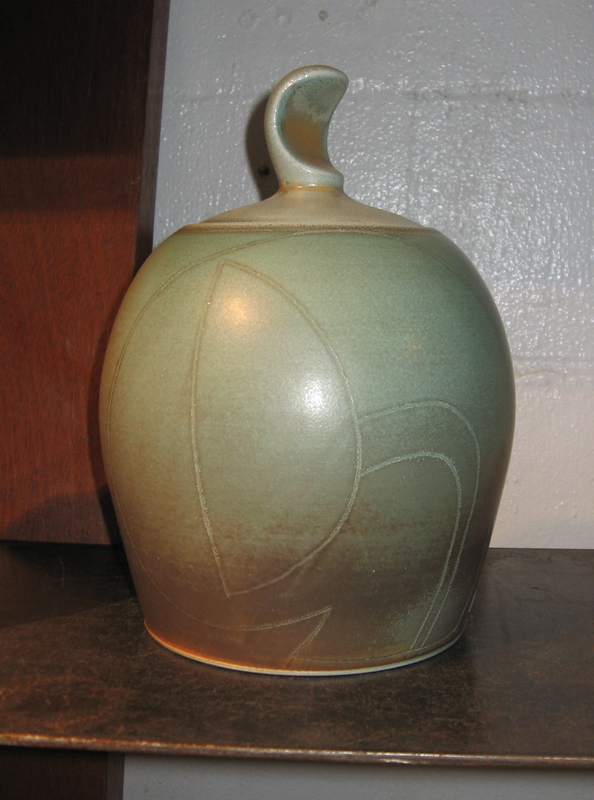 A bumpy ware vase from the artist’s website. 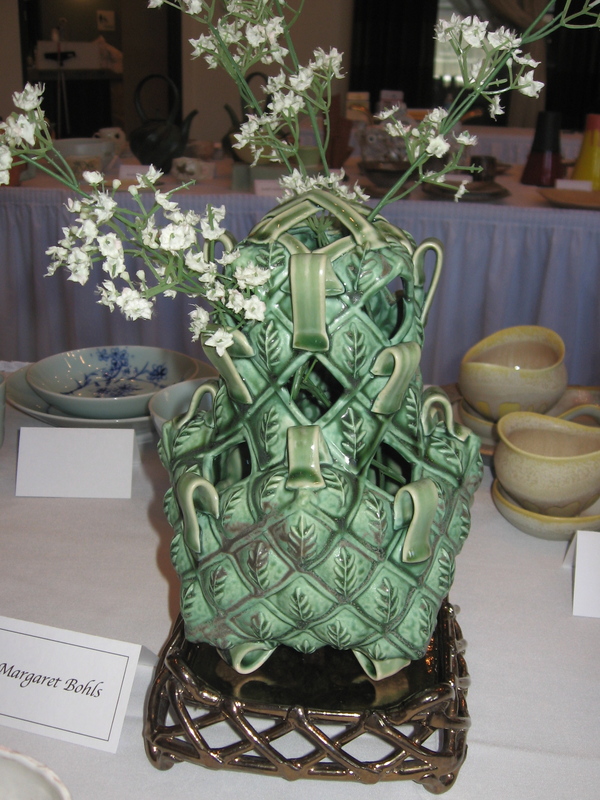 The lattice base is usually constructed with earthenware. She also fires the vase on wasters so the feet don’t get caught on the kiln shelf as the vessel shrinks, which would warp the whole form. My trial pots from the 1st day, re-using the same template for all 3. I churned out three pieces between demos on the first day, from a paper template I generate with three darts instead of four. One of the darts is tied into the full length seam-line as well. 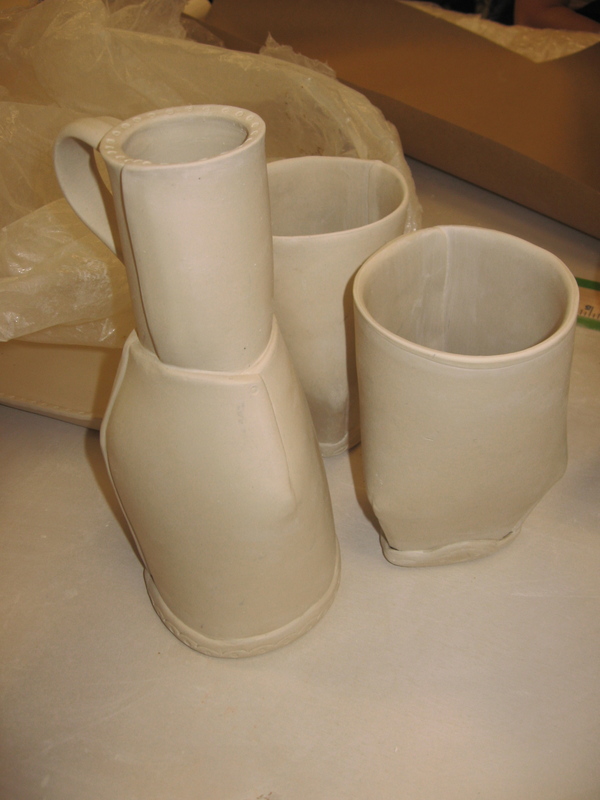 Due to uneven drying rates in the clay lab, two of these cracked insanely but here they are for posterity. I like the process and for some reason I’m able to really cover some ground working with slabs. Other than the fact that porcelain is really finicky about cracking and the method creates a lot of waste I really enjoyed the process. 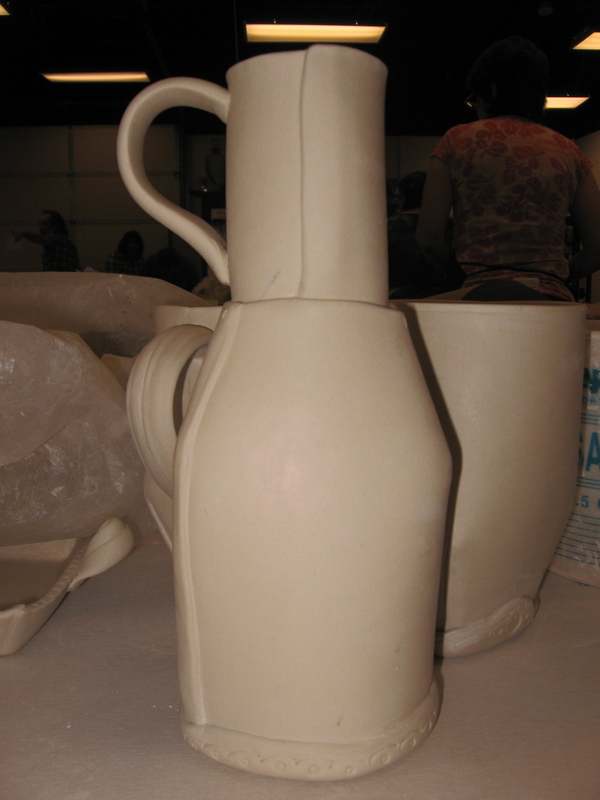 A bottle vase with handle. Despite being covered with a small piece of additional plastic around the handle, a massive crack rendered it unsalvageable. On the second day I made an oblong rounded rectangular tray with surface texture and handles on each end. It cracked also, but I patched it and wrapped it carefully so we’ll see what happens. At least I can snap a reference photo before destruction if it fails. 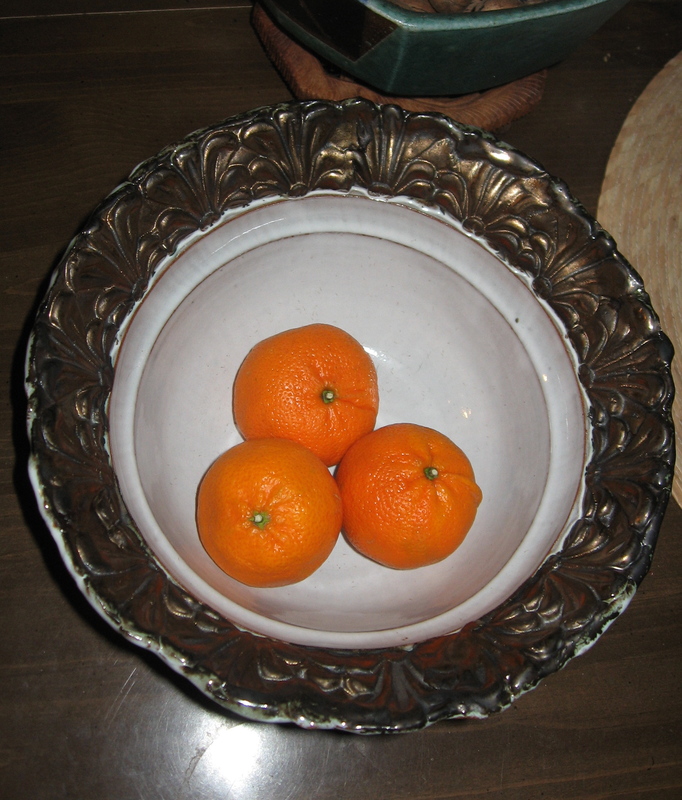 I also constructed a medium-sized square bowl with an added jelly roll foot ring. So far no issues with that one. My demo pots from the third and final day. On the third day she demonstrated the foam texture method so I constructed this tall canister jar. I also hammered out a giant butter dish with a press mold of my own design, both textures based on a Japanese kimono textile pattern. The lid flange for the jar is on the bottom part, which according to Margaret helps keep the walls from warping since the top of the lid usually keeps that part from shifting. Although I was tempted to trace Margaret’s templates, all of my pots came from paper pieces I cut myself based on her techniques. I used bisque and leather tooling stamps to create most of the textures other than those on the walls of the jar. I added three of her gorgeous black slab-built pots to my collection. At lunch on the first day of the workshop demo participants pulled numbers and selected pots via lottery. 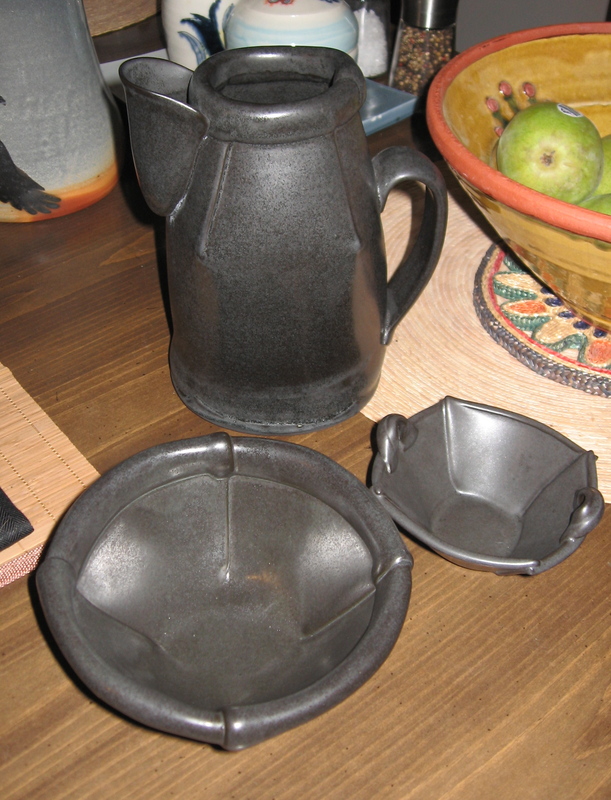 I went more overboard than usual with this haul, but each piece spoke to me and I love the sumptuous black glaze. I can’t believe it’s not reduction! (pun intended) But yes, these are fired in oxidation. I already acquired one of her square slab-built dinner plates from AoTP last year, also. Here’s another view of the pitcher, yum! I thoroughly enjoyed the workshop and learned a ton of new techniques to bring into my home studio. Thanks, Margaret Bohls! Artist Trades = the Best! 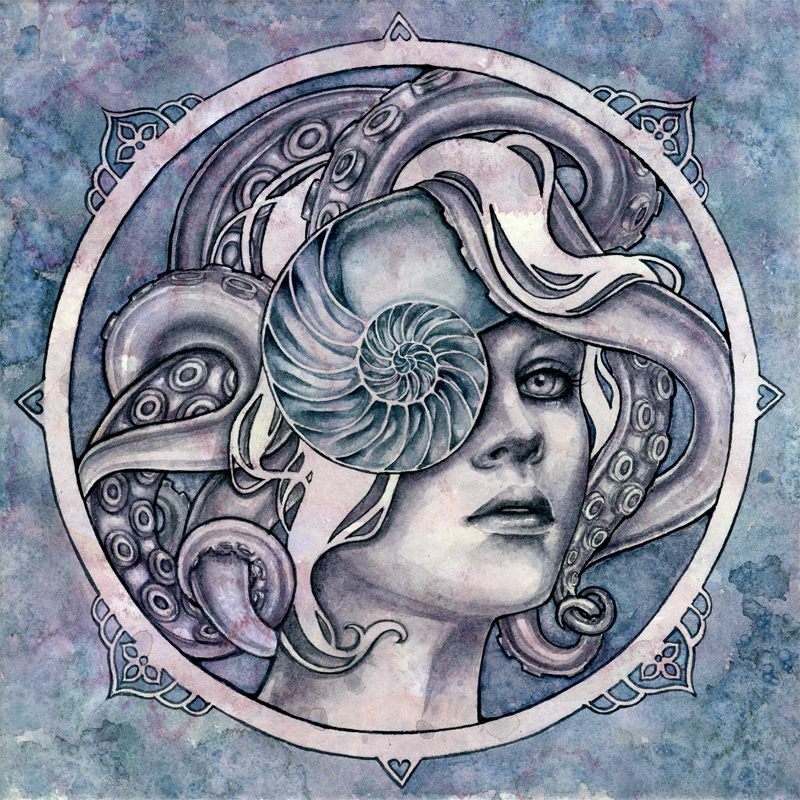 I recently completed a trade with the uber-talented watercolorist Kelly McKernan. Check out her website and available artwork/prints HERE. 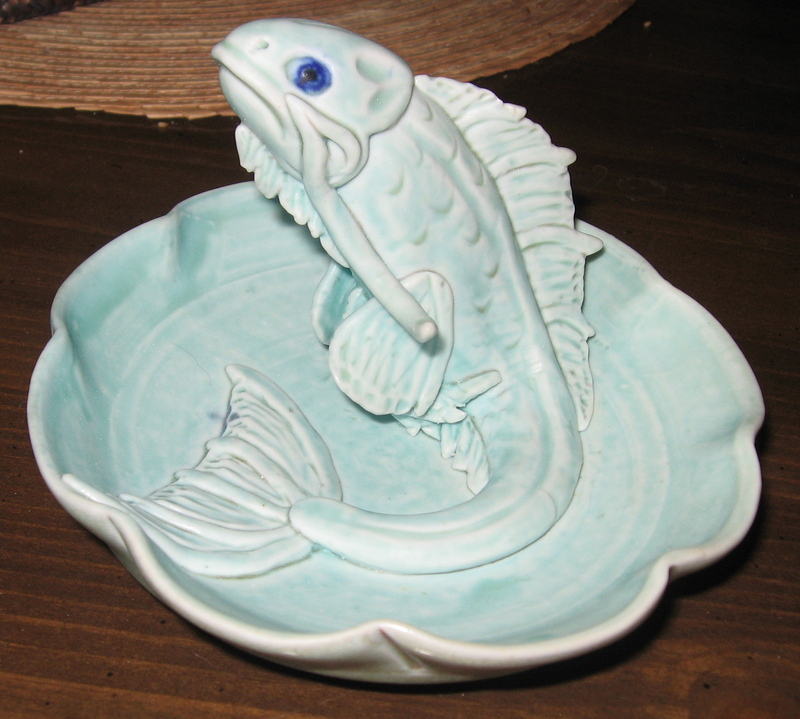 I completed a partially wheel thrown and partially hand sculpted jewelry tray out of high fire porcelain clay in the shape of a koi-like whiskered and hairy fish with expressive fins per Kelly’s request. 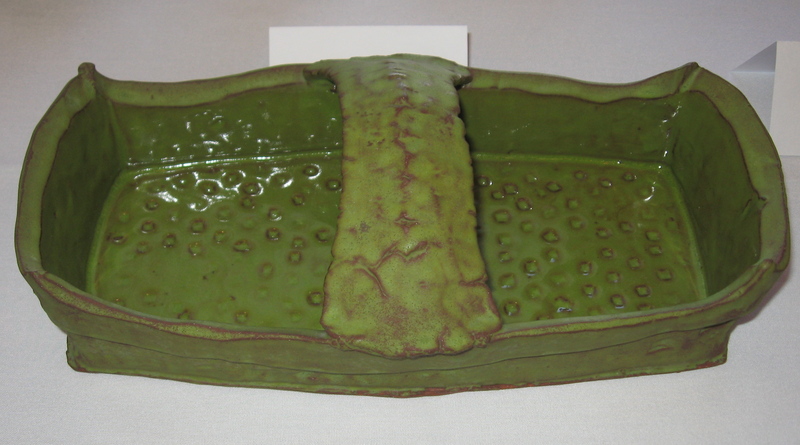 Slip colored with blue stain defines the eyes, with pale green glaze on the interior and a responsive copper glaze underneath. The whiskers are curled upward to allow rings or earrings to dangle securely. I had to finish sculpting in one day, since porcelain is so finicky and prone to cracking or warping. Fortunately the long hours yielded a successful result. 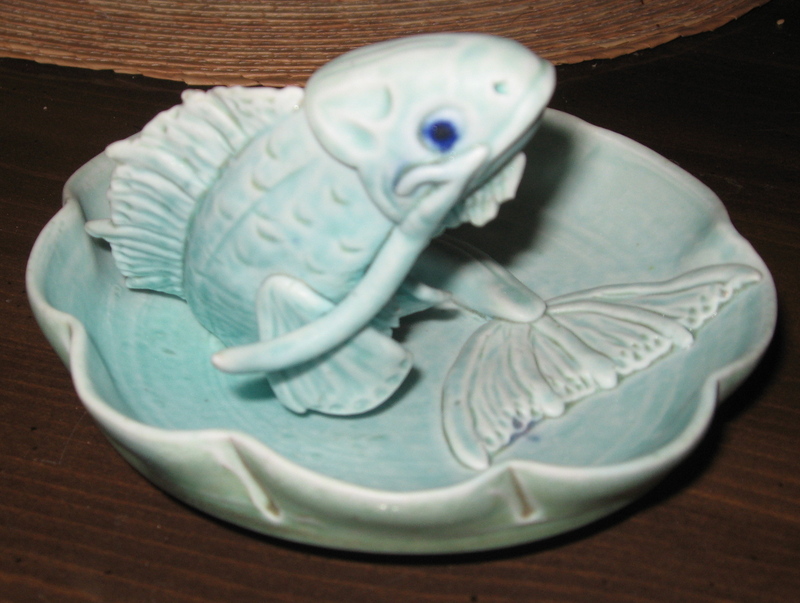 Some Bright Green glaze colors the fish and tray interior. 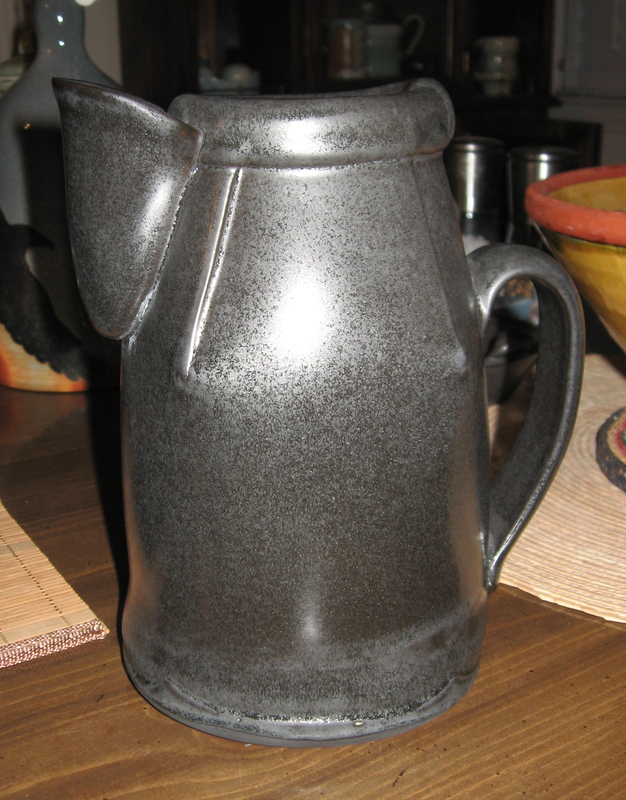 Ryan’s Green to Black glaze on the exterior, featuring results from a cone 10 salt firing. Watercolor painting on 8″ x 8″ cradled watercolor paper by Kelly McKernan. I know, right? Needless to say it’s gorgeous and I love it. The cradled watercolor paper doesn’t require framing, and just needs a wire installed on the back to hang. If you love it as much as I do the set of mini-prints on Kelly’s web store includes this image, which she titled Elide. Artist trades really are the best! Spring always keeps me busier than I expect, so in the interest in covering a lot of ground here’s the remainder of my photos from the most recent NCECA conference in Houston, TX. 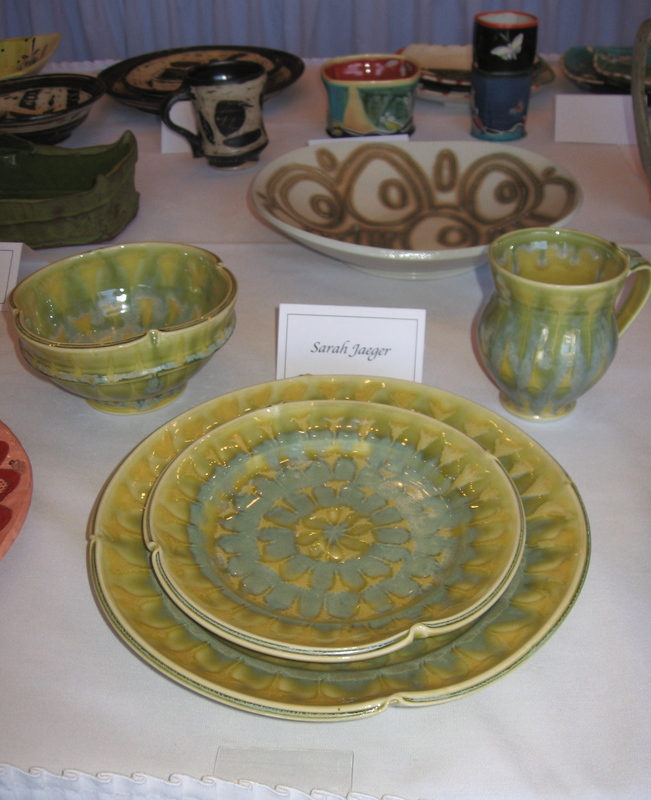 Almost all of them hail from the Santa Fe Clay La Mesa show, except for the last photo from a demonstration. 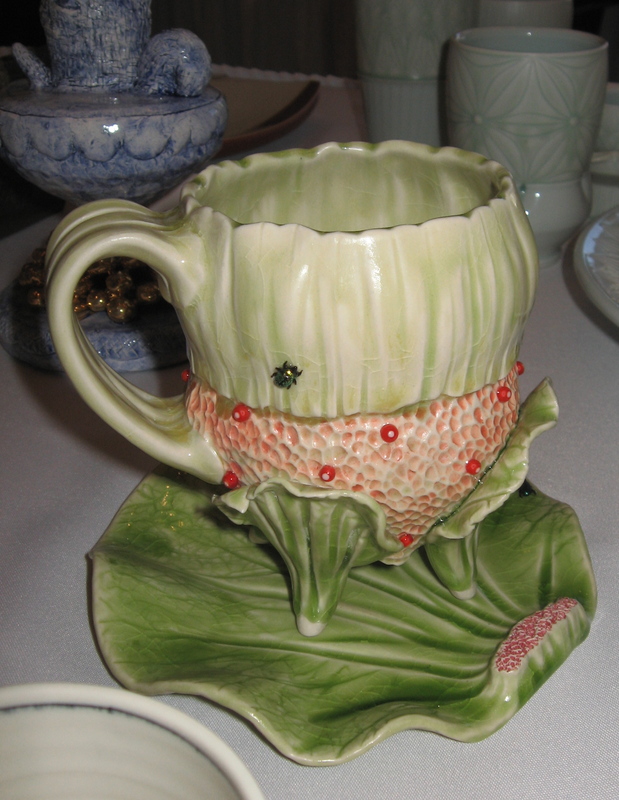 Bonnie Seeman cup and saucer. 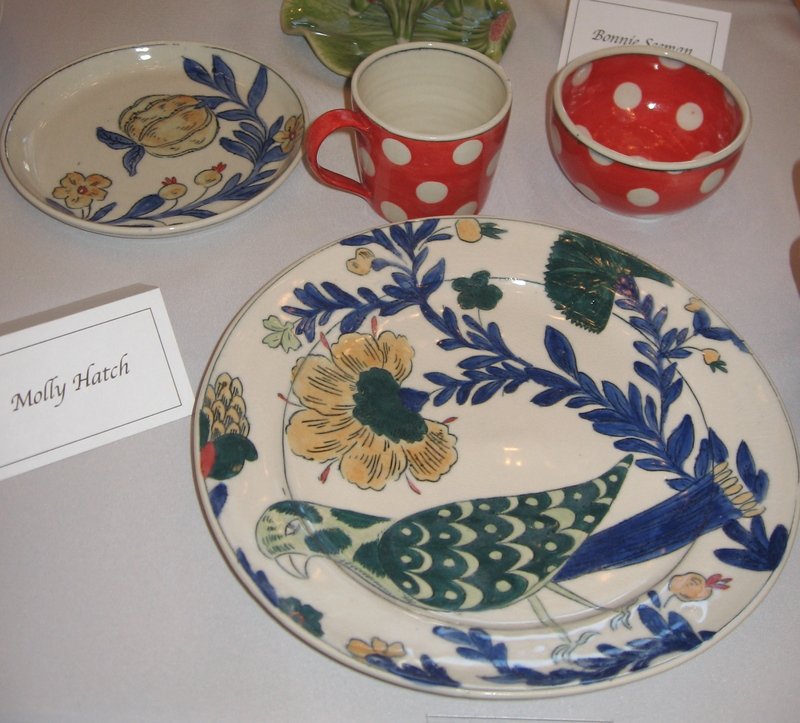 A gorgeous place setting by the popular potter Molly Hatch. 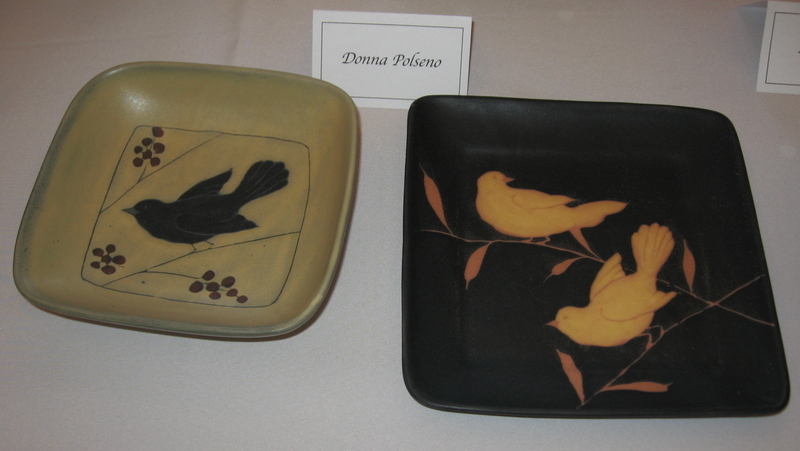 Bird plates by Donna Polseno. Lisa Clague expressive sculptural cup. 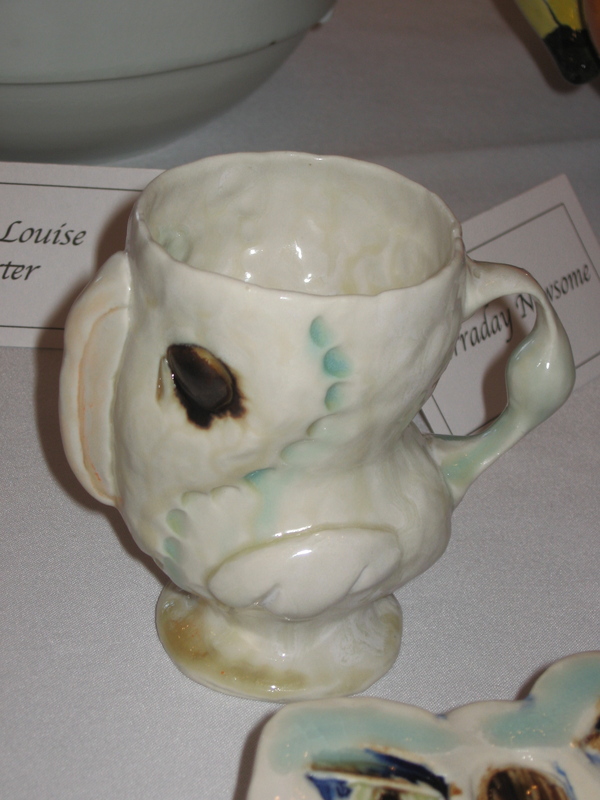 Sculptural bird cup, also by Ms. McClurg. 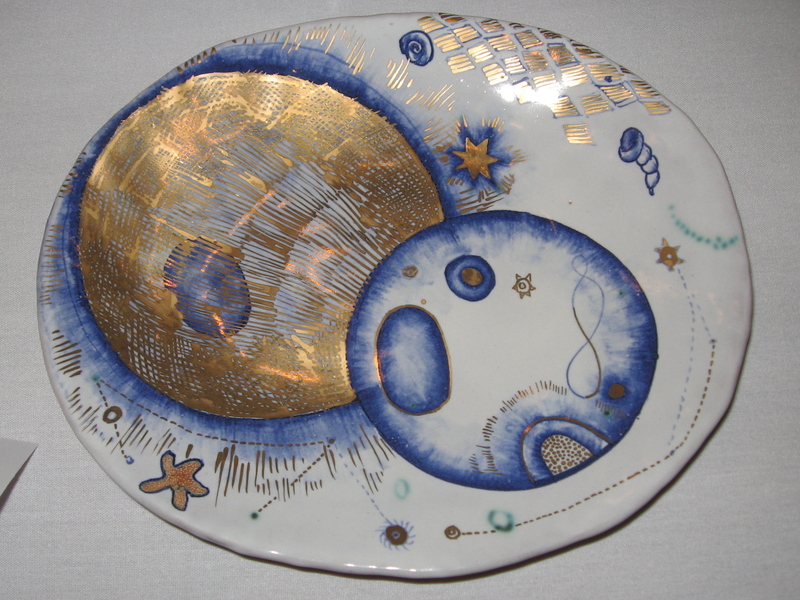 Liz Quackenbush cobalt and gold luster plate. 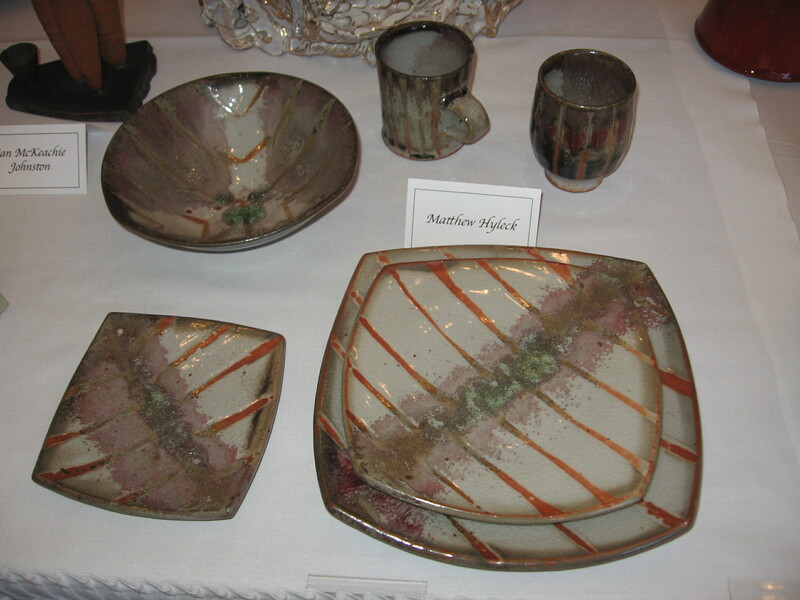 Matt Hyleck simply patterned place setting. 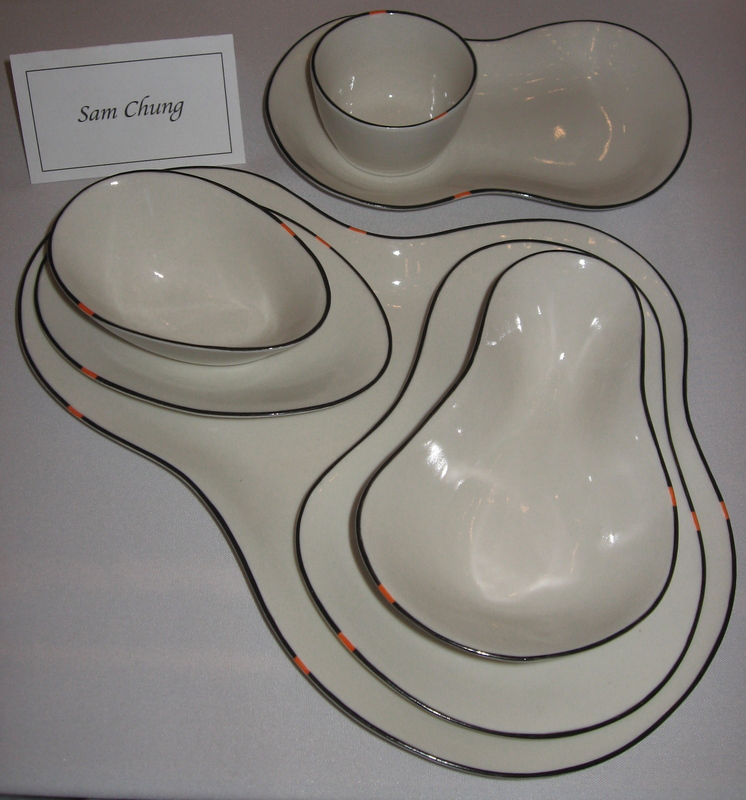 Sam Chung slipcast dishes with artfully aligned rim coloration. 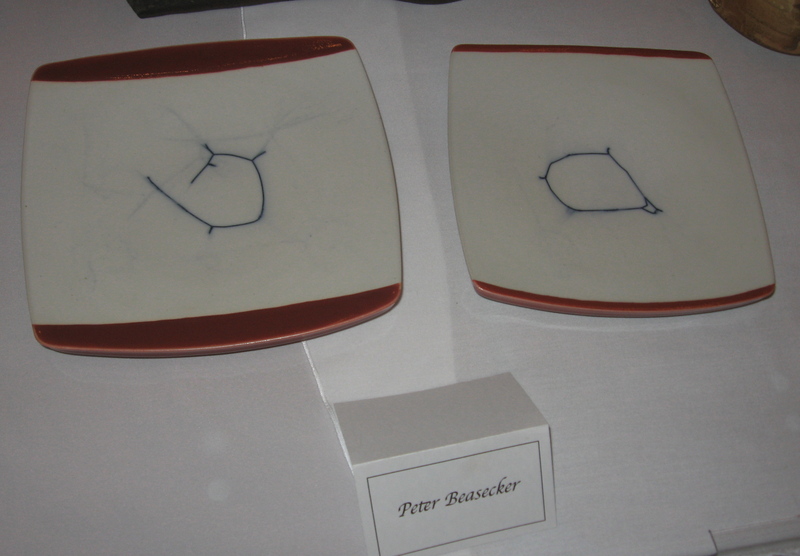 Peter Beasecker porcelain string series plates. 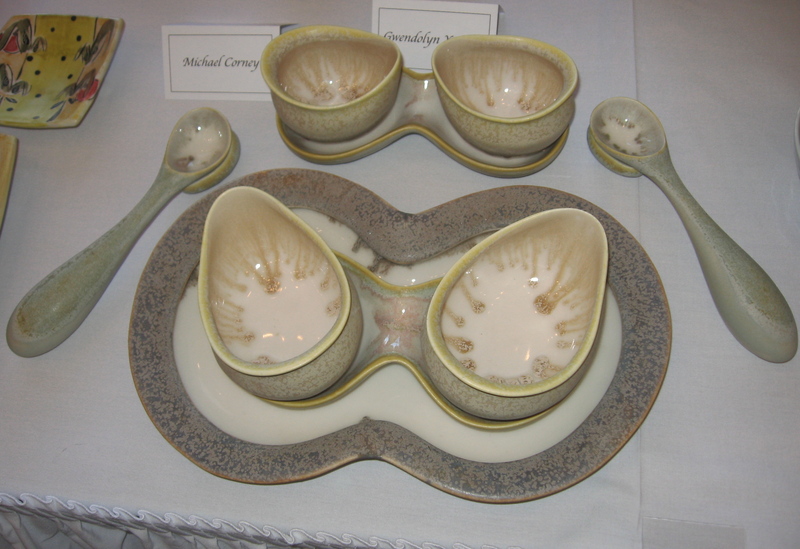 Gwendolyn Yoppolo 2-person serving set with microcrystalline glazes. Sunshine Cobb handbuilt earthenware basket with sandblasted glaze. 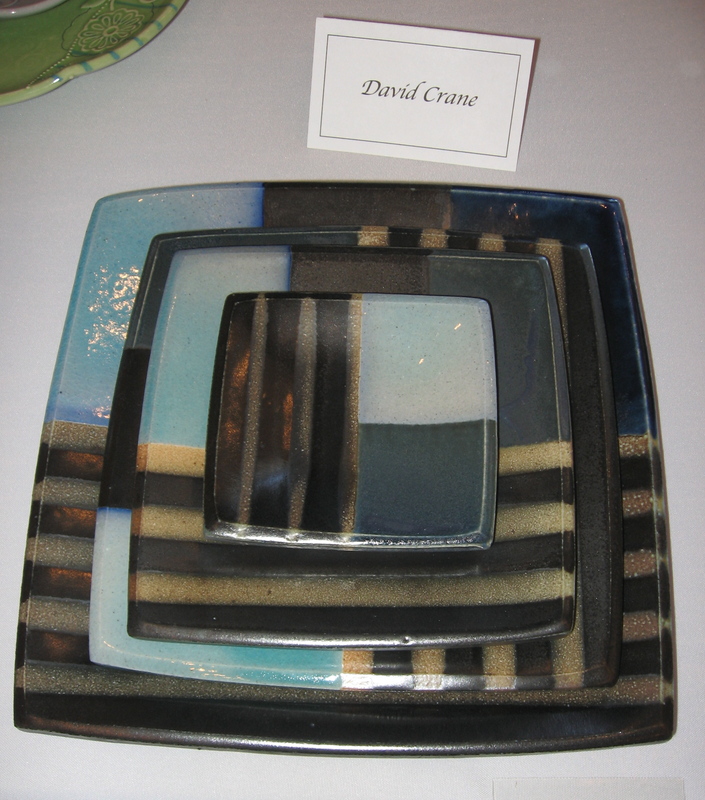 David Crane beautifully glazed nested square plates. 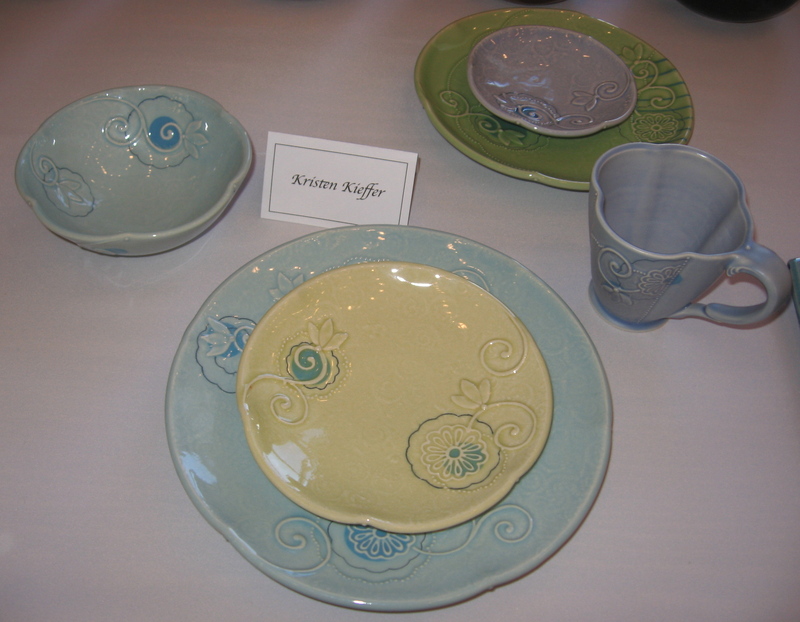 Kristen Kieffer stamped and patterned place setting. 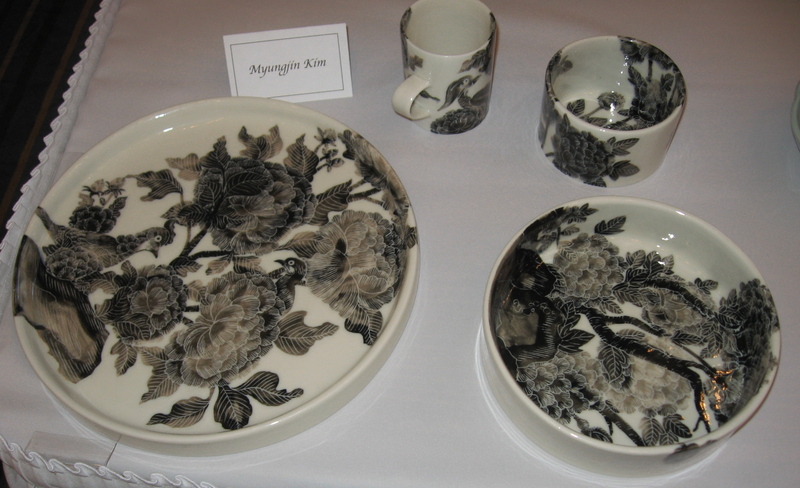 Myungjin Kim place setting with beautiful black sgraffito drawings. 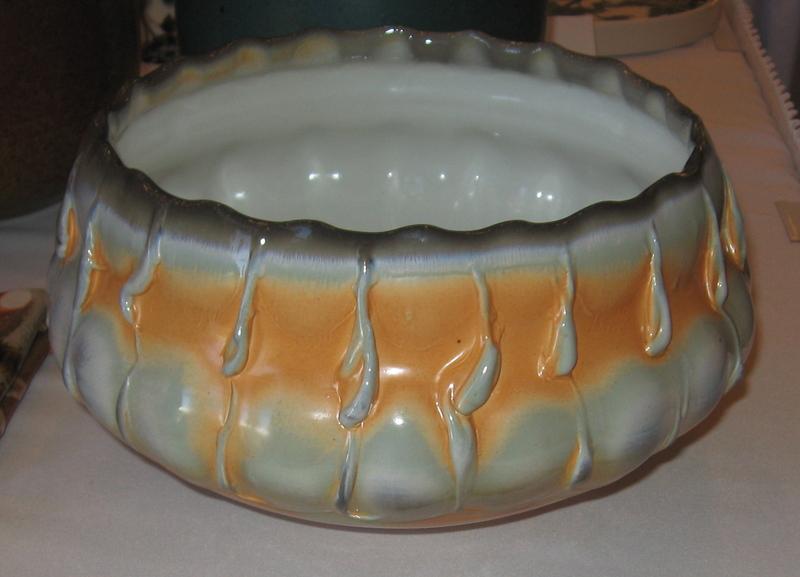 Brenda Lichman large soda fired serving bowl. 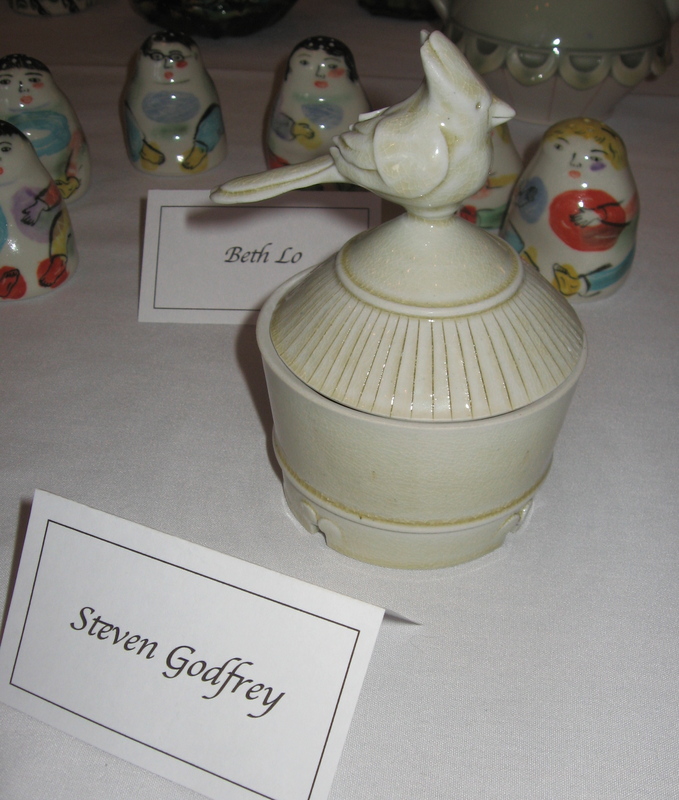 Steven Godfrey bird-topped salt cellar jar. 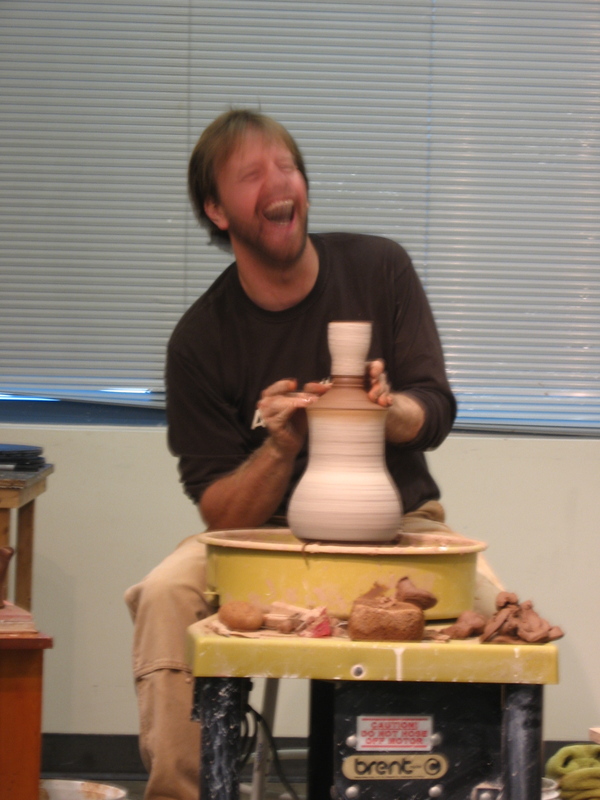 Jake Allee cut and reassembled vase from a live demo. This is a continuation of the recap regarding my recent trip to Houston for the NCECA conference. I am like a hound on a scent with taking photos of finished work that I like. Enjoy the following photos with explanations. 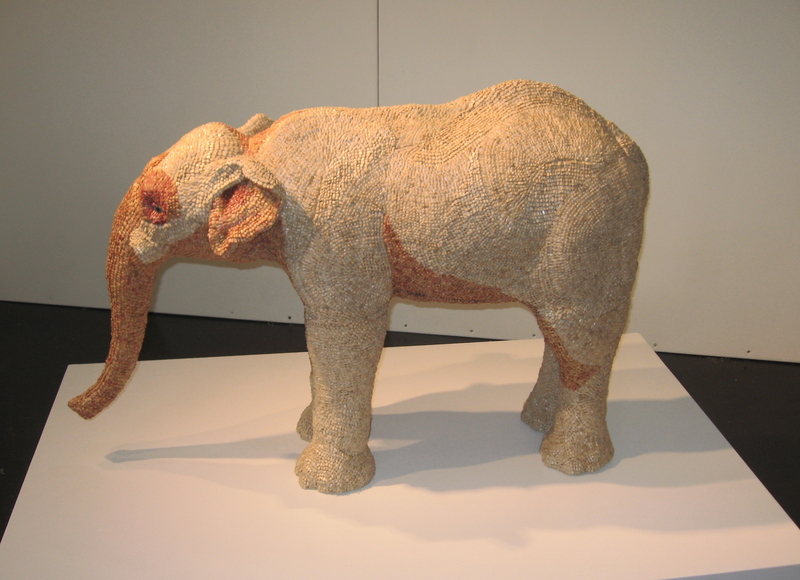 This clay sculpture of an elephant stood at roughly the height of a large breed dog, and has sunflower seeds carefully encrusted as a sort of strange skin. 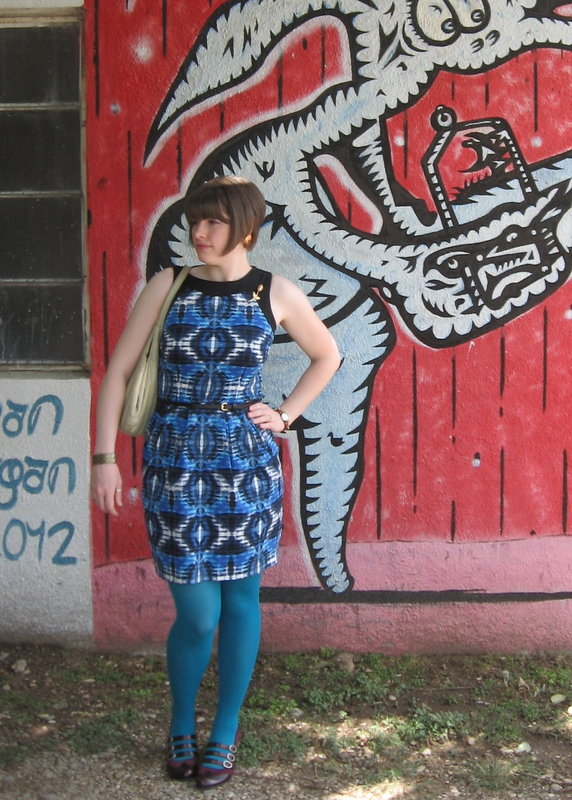 Lindsay Pichaske was one of the Emerging Artists for the conference. A close-up of the elephant’s face. The sculptor’s use of taxidermy eyes and expressive facial features somehow both adds to a sense of beautiful morbidity: lifelike deadness. 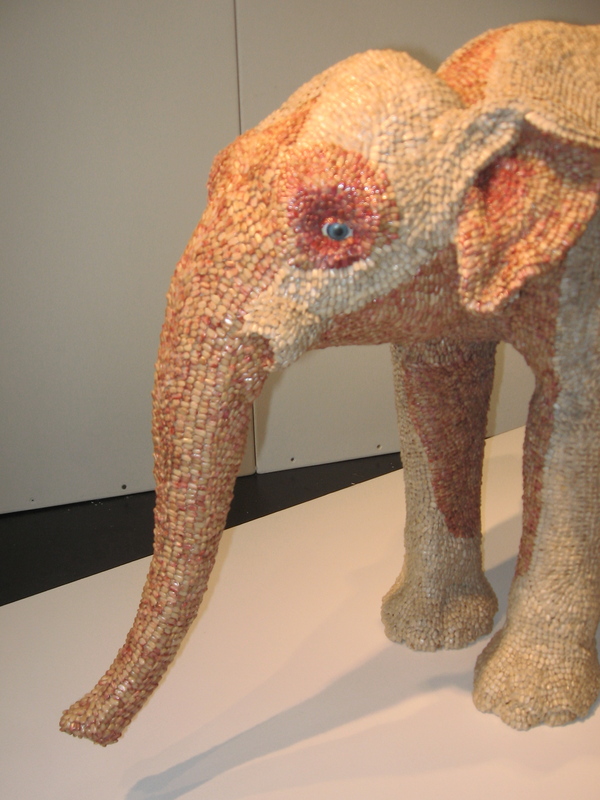 The other sculpture on display by Lindsay Pichaske. This beast has a more human-like face and a strangely proportioned mythological overall appearance. Being coated in ombre silk petals will do that, I suppose. This is the first of many images from a show I always truly enjoy and have made of habit of photographing at length, La Mesa hosted by Santa Fe Clay. 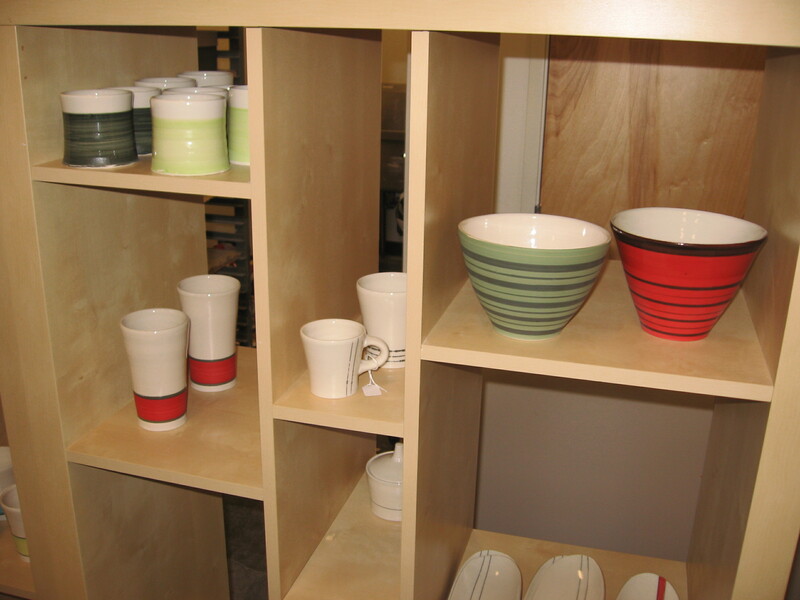 Featuring all manner of tableware, the show always attracts scores of viewers and thus always stays close to the conference center for accessibility’s sake. 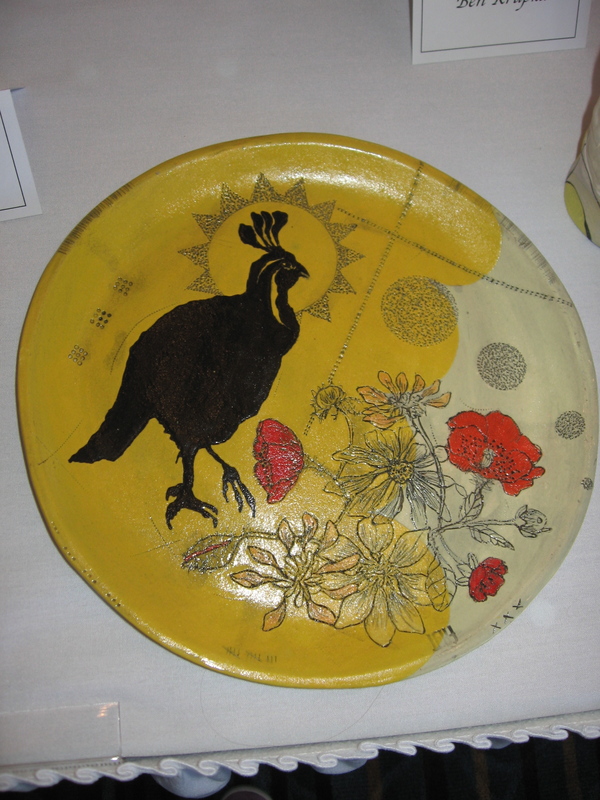 Diana Fayt, shown above, makes beautiful drawings on her dishes accompanied by animal silhouettes and has a lovely sense of color. 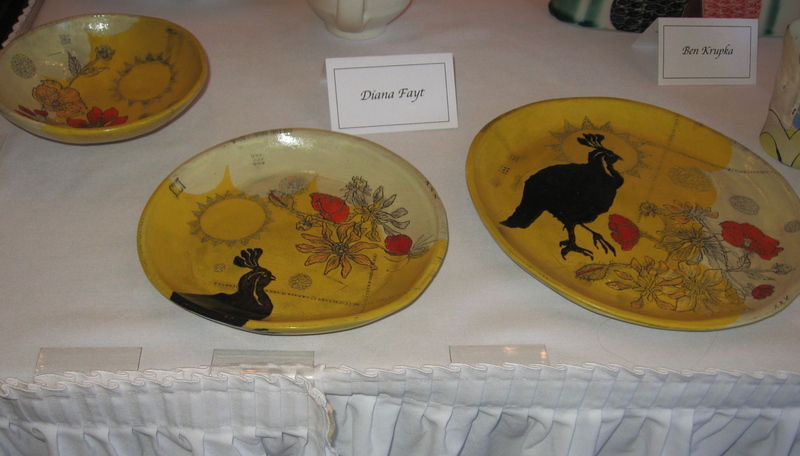 Each artist presented either one or several pieces, in this case Diana Fayt executed a themed place setting. Stacked plates by Susan Dewsnap. 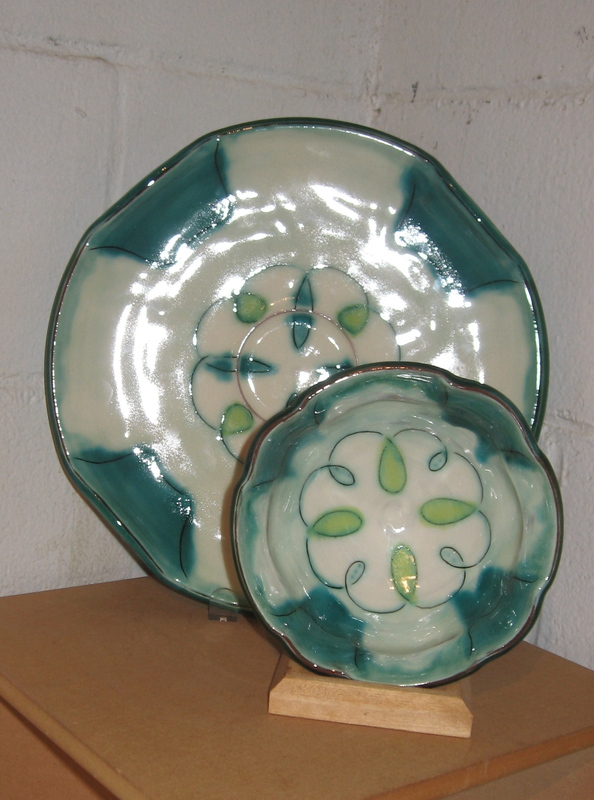 The beautiful pattern style on Susan Dewsnap’s pieces probably utilize wax to resist the pattern from the glaze and likely received atmospheric firing due to the color variation. 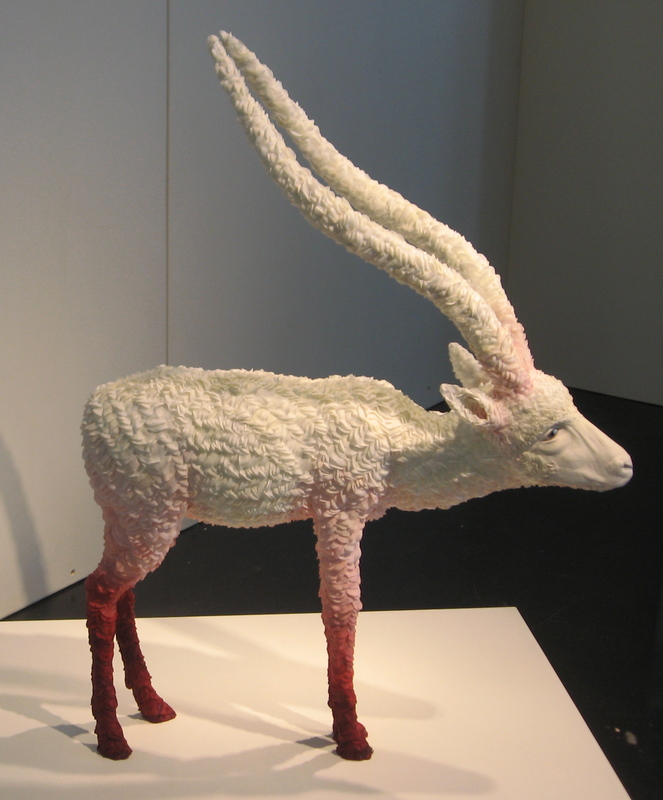 I suspect soda firing since much of her work elsewhere reflects that description detail. I love a soda fired porcelain pot with a fumed copper glaze: a woman after my own heart! Despite the name this stamped porcelain pot by Margaret Bohls really is light in weight. 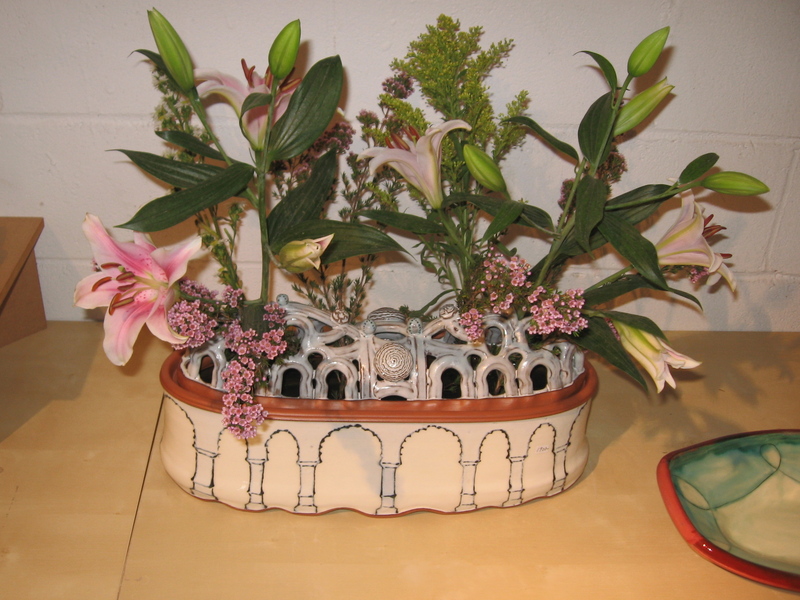 A vase to me typically has only one orifice for flora whereas a flower brick offers multiple outlets. 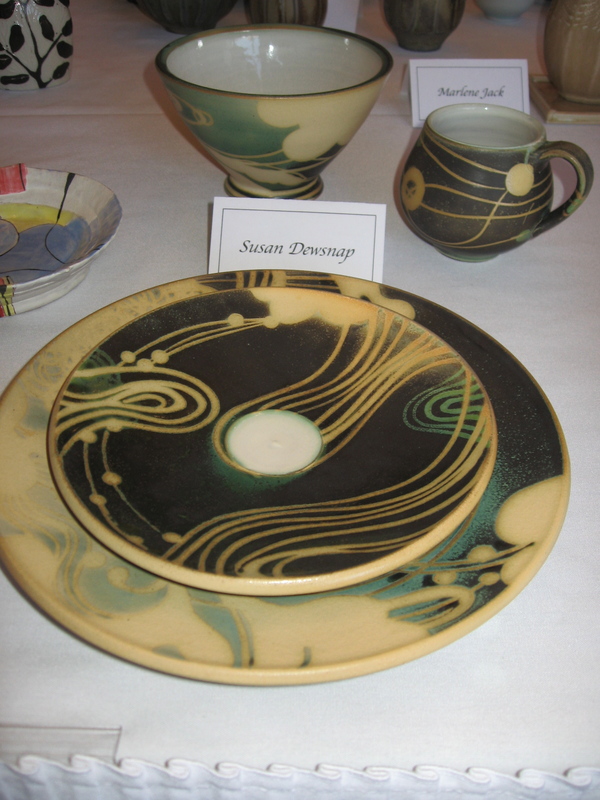 Another place setting, by Sarah Jaeger. 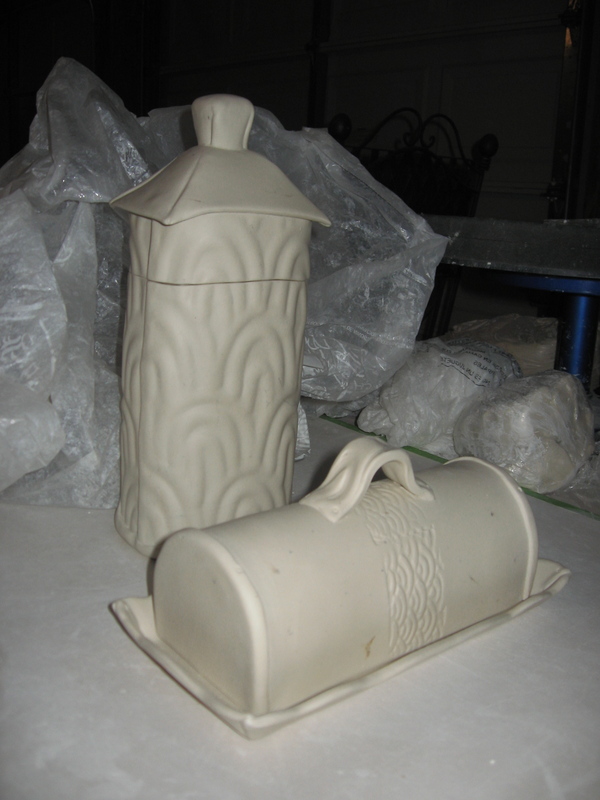 Some more porcelain pots, this time beautiful forms featuring a focus on glaze interface. 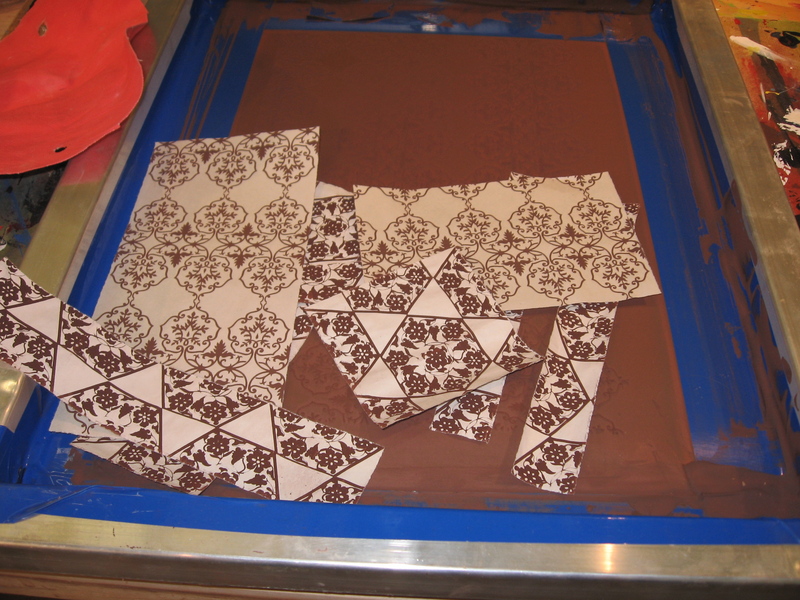 Sarah Jaeger works meticulously on how she patterns and blends her glazes together. Place setting by Suze Lindsay. 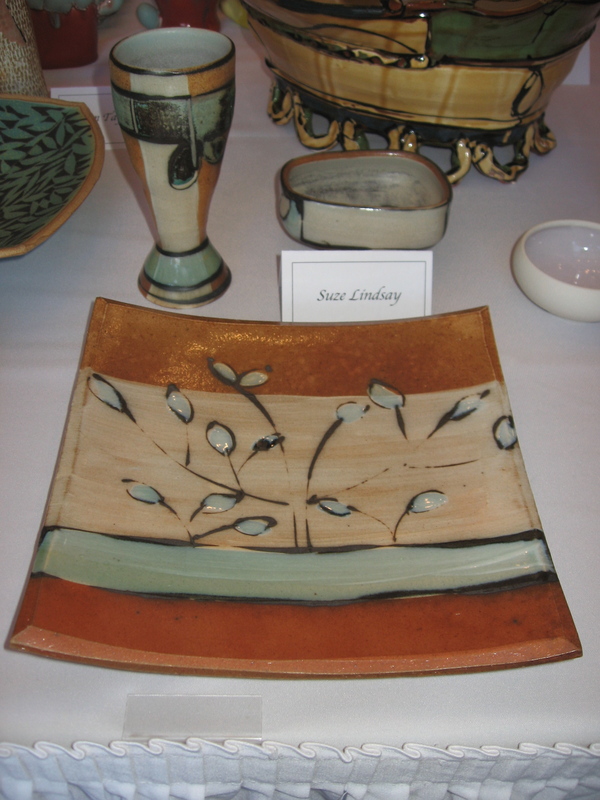 I have loved the line quality and quiet sophistication in Suze Lindsay‘s pots since my college days. Again, well-executed atmospheric firing brings about part of my admiration. 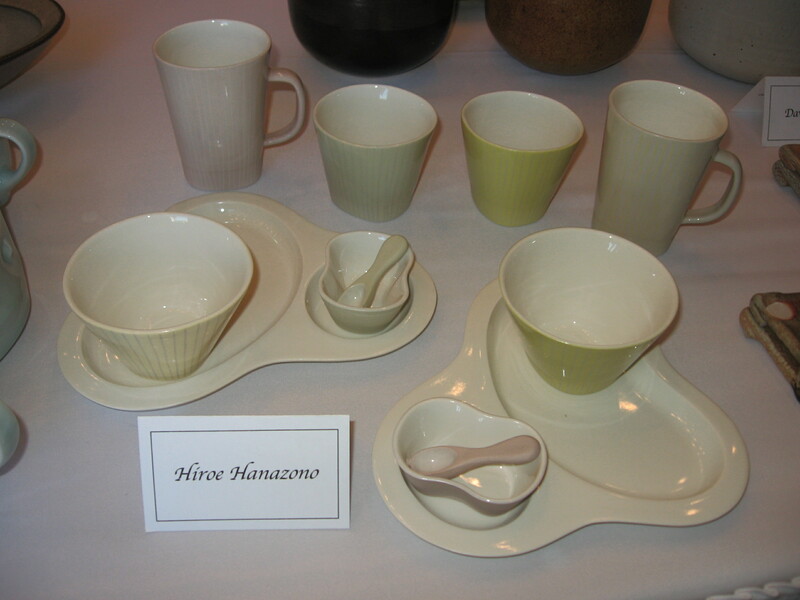 Multiple slipcast options by Hiroe Hanazono. 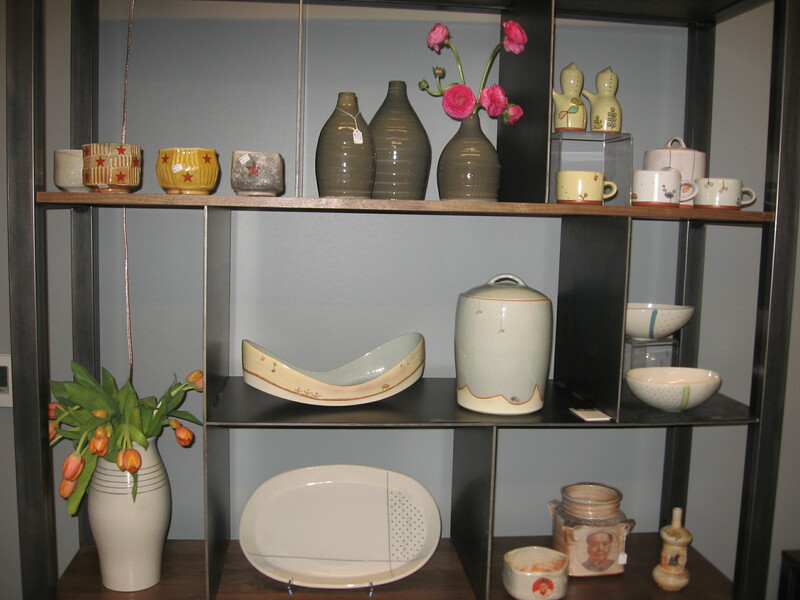 Resplendent in pastels a bevy of streamlined self-serving objects pepper this display by Hiroe Hanazono. Silver luster on a jar by Jeremy Kane. I am not that familiar with Jeremy Kane but I liked this jar for it’s craftsmanship and humor. Pticher and teapot by 2 very different potters. 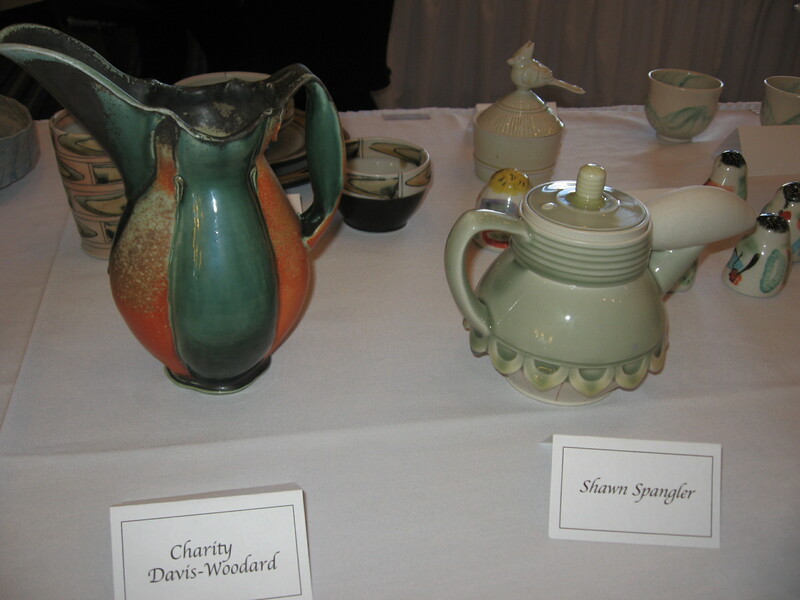 On the left another of my favorite atmospheric potters Charity Davis Woodard has elected to present one of her distinctive pitchers alongside a highly precise and meticulous teapot by an equally talented but totally different artist named Shawn Spangler. 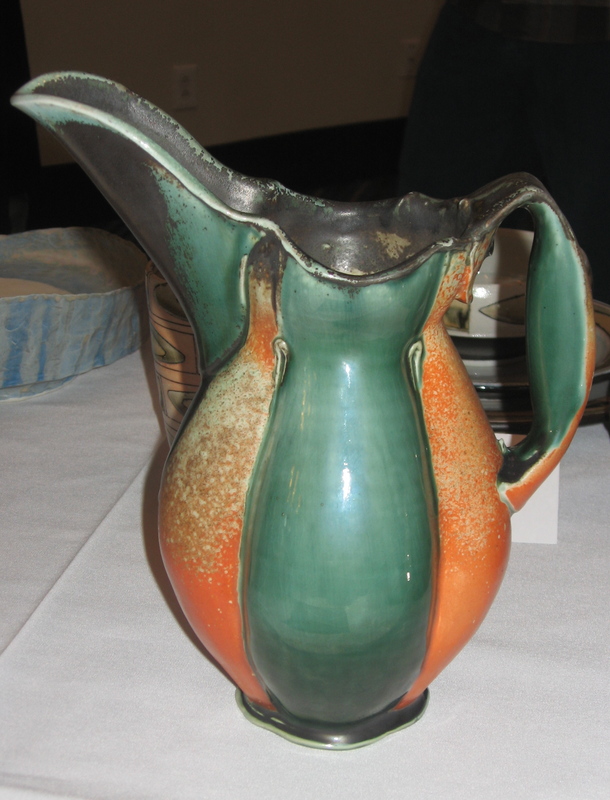 Detail of the Charity Woodard pitcher. I’m crazy about this form plus the handle feels amazing in my hand. 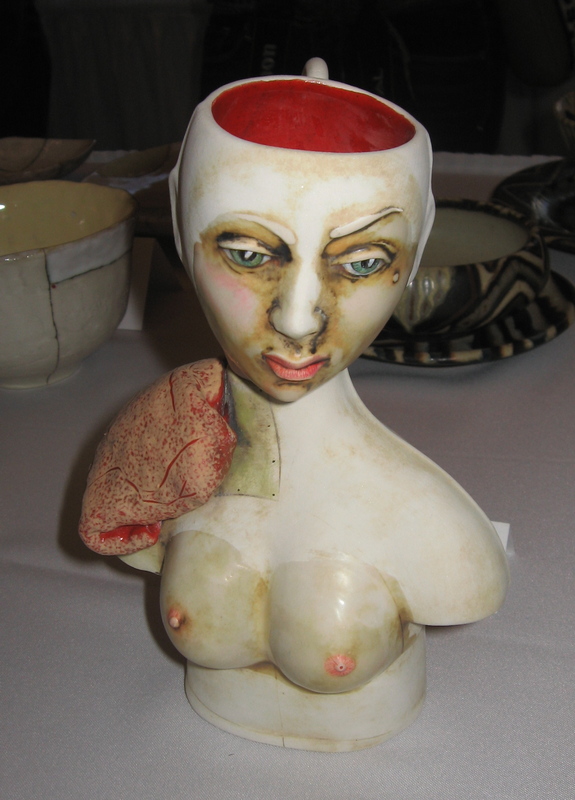 Oh, the lovely kitsch of Sue Tirrell! A personal connection to farming and Western culture emerges in these absolutely killer drawings/pots by Sue Tirrell. 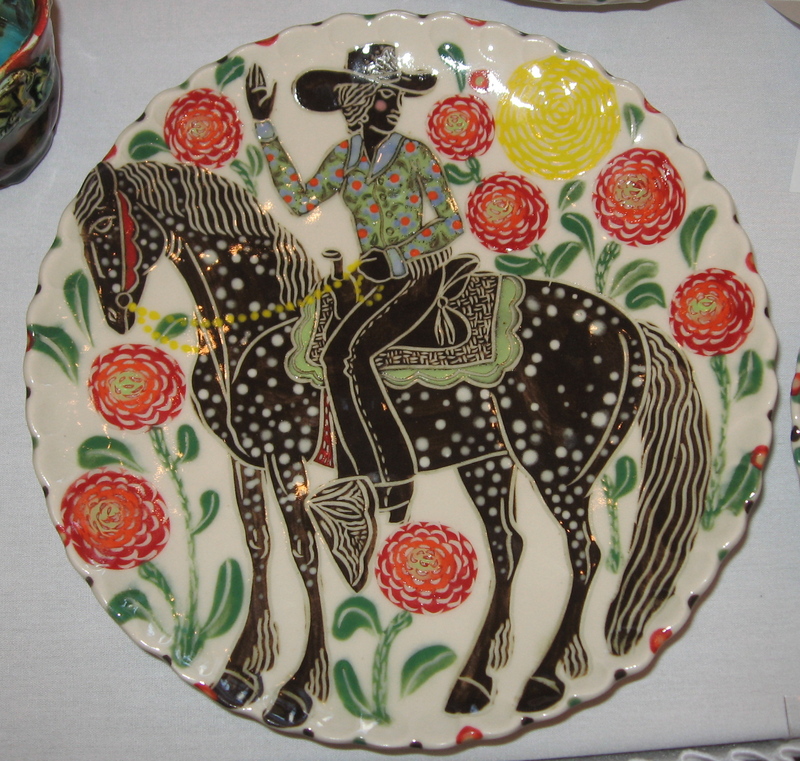 Detail of the dinner plate. Would you be surprised if I told you Anthropologie is currently selling a few of Sue’s designs? I thought not. Also, google Objective Clay before midnight this Thursday to get the skinny on a happening group of potters, some of whom have work featured in this blog post. Stay tuned for the next segment of my conference recap! 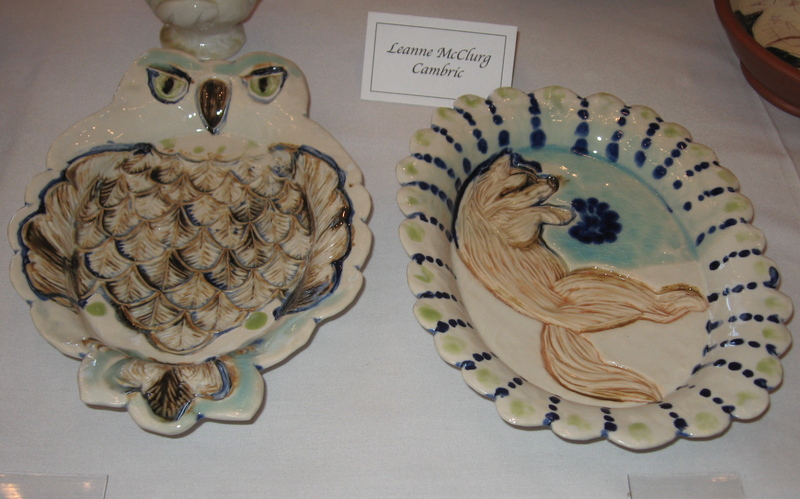 I recently returned from the National Council on Education for the Ceramic Arts conference, which was held in Houston, TX this year. As a native Texan I made sure to attend. I watched and experienced a number of inspiring and significant presentations, demos, and gallery exhibits from which I managed to photograph sporadically. The following should fall primarily into the eye candy category: enjoy! My donation/entry to the cup sale. 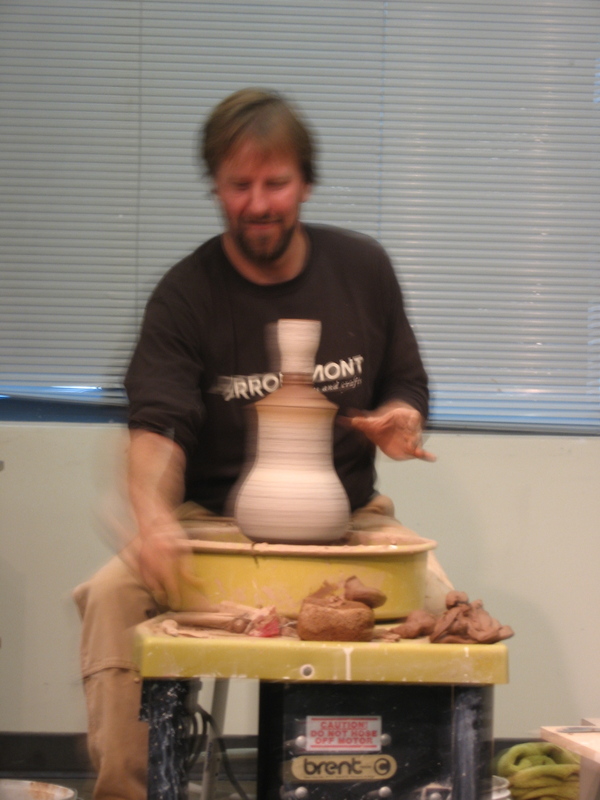 Every year hundreds of potters donate cups to be sold for scholarship funding, with a select few juried into the Cups of Merit category. 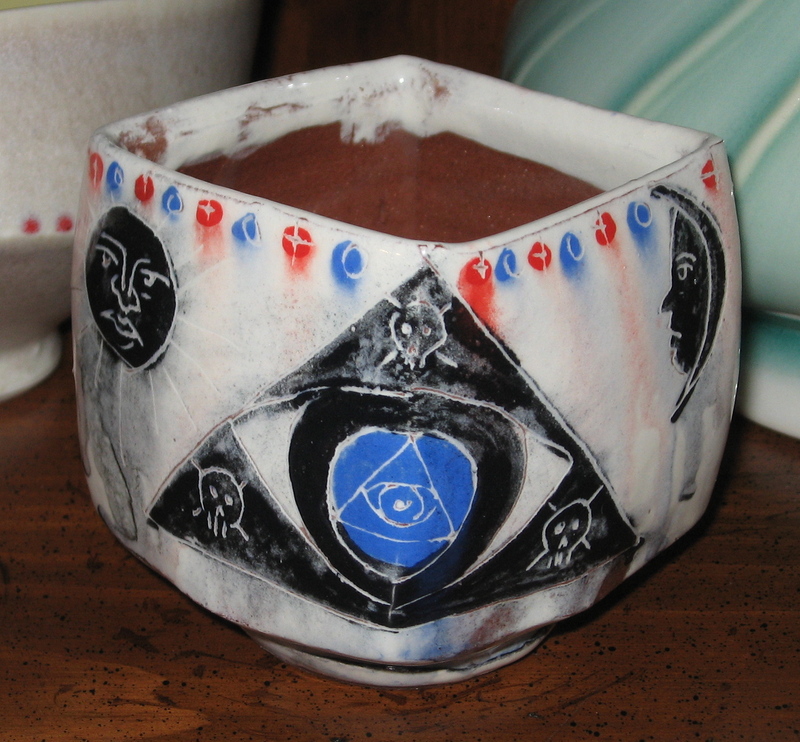 My cup is grolleg porcelain, thrown on the wheel, altered, darted, stamped, slip-trailed, and finally ornamented with sprig molds. I always strive to apply visual interest all over my pieces. 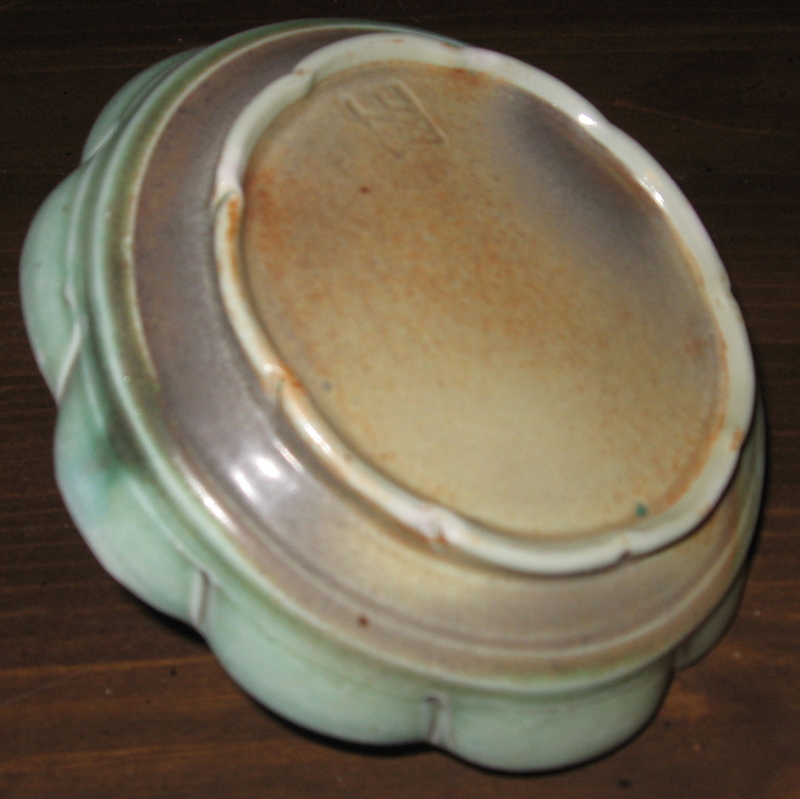 The salt firing barely touched inside the foot ring, which exhibits a smooth, faintly shiny texture. 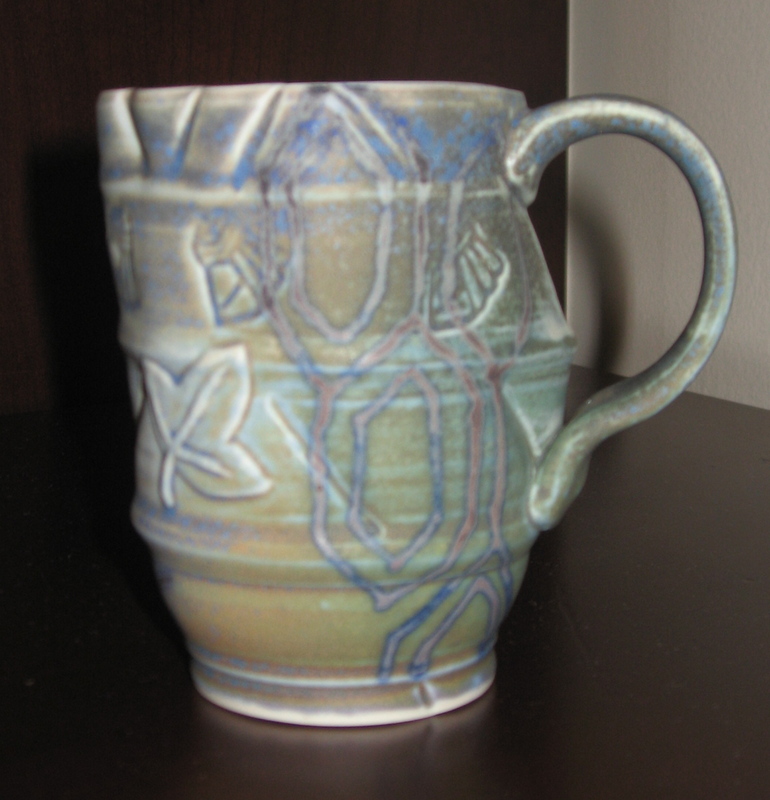 The brightness of the blue slip goes pastel along with the speckling and fuming in the glaze overall. I quite liked this cup and I hope whomever it ended up with feels an attachment to it. The above images partially serve as a visual record for myself, since I usually forget to photograph pots before they get disseminated into the world. I also added a couple of fresh pieces from other potters to my collection from various sources (18 Hands Gallery, Red Lodge Clay Center, NCECA cup sale) at the conference after a reasonably long hiatus from buying pots. A. Blair Clemo medium sized bowl. 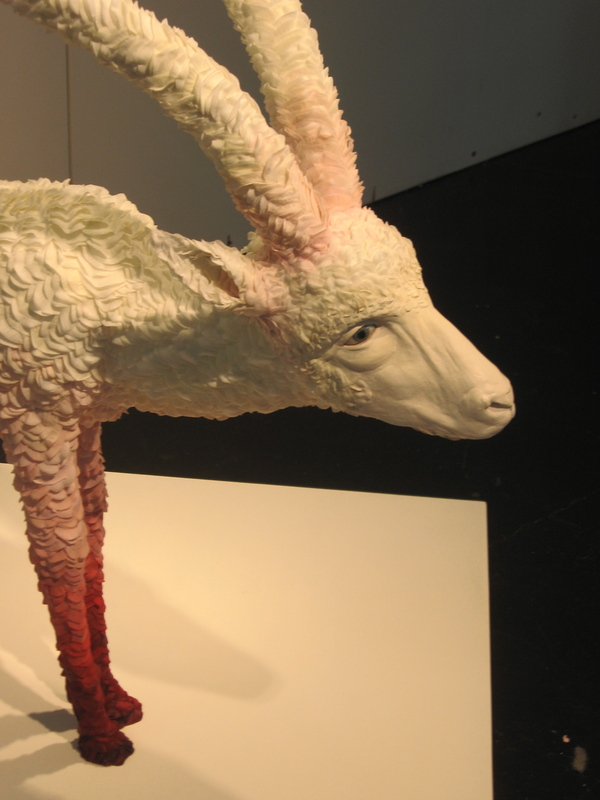 I try to spread my patronage out amongst the bevy of talent available in the world of ceramics. This texturally varied wheel-thrown and press-molded bowl is my first addition of Blair’s work, with one of his signature patterns and gorgeous bronze glaze around the flared rim. 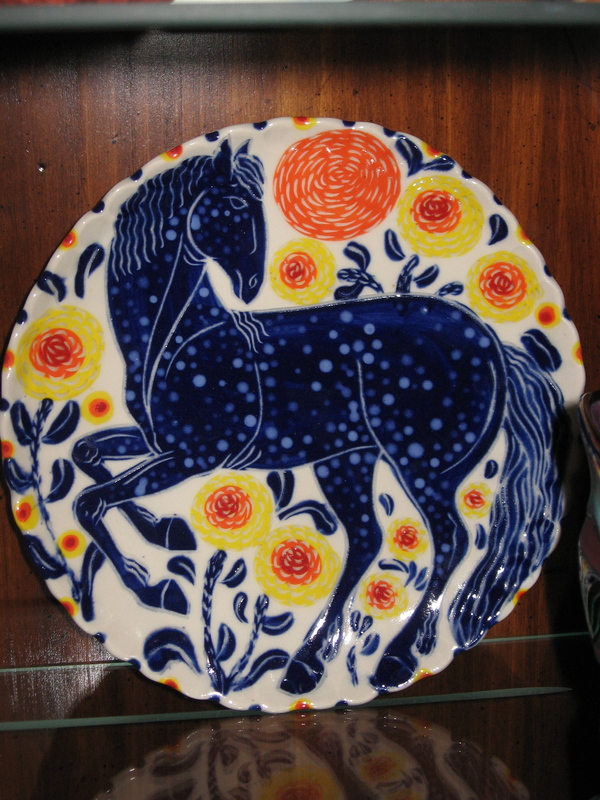 Finally, I scored a Sue Tirrell horse plate. If you don’t know already, I have sort of a horse obsession. Not just the subject matter but the beautiful colors, technique, and line quality justified this addition to our carefully curated plate collection. In reality the pots we use in our kitchen most often are the plates so this lunch-sized gem promises to serve us well. A birthday present for hubby. 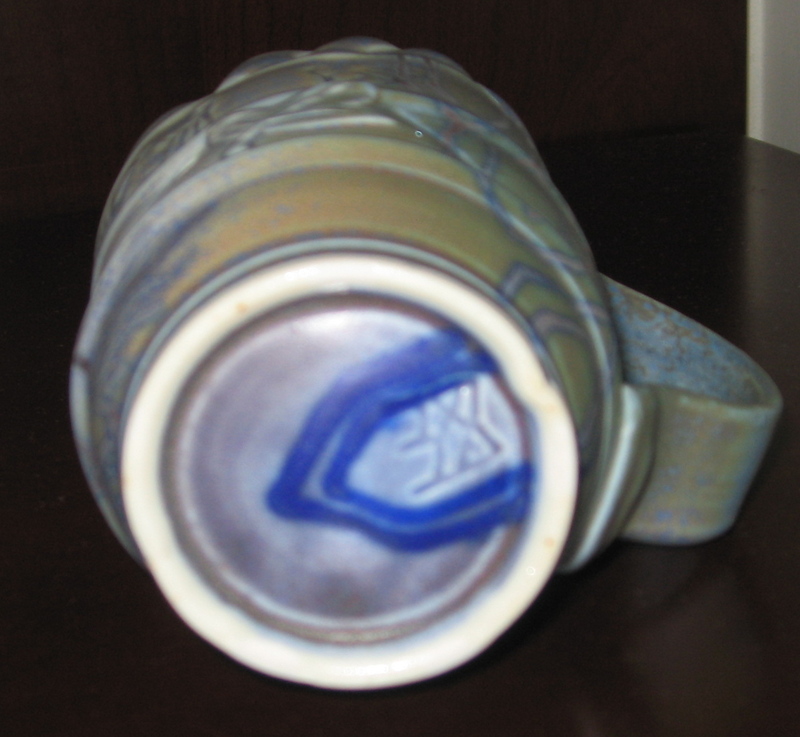 A wheel thrown earthenware cup by Adam Posnak jumped out at me, and after returning to it daily for 2 days I knew it was meant for my husband. The skulls, lunar vs. solar, and masonic iconography definitely fall in line with my mister Aaron’s spiritual practice plus the cup just sings with earthy beauty. Freshen Up cat mug by Chandra DeBuse. 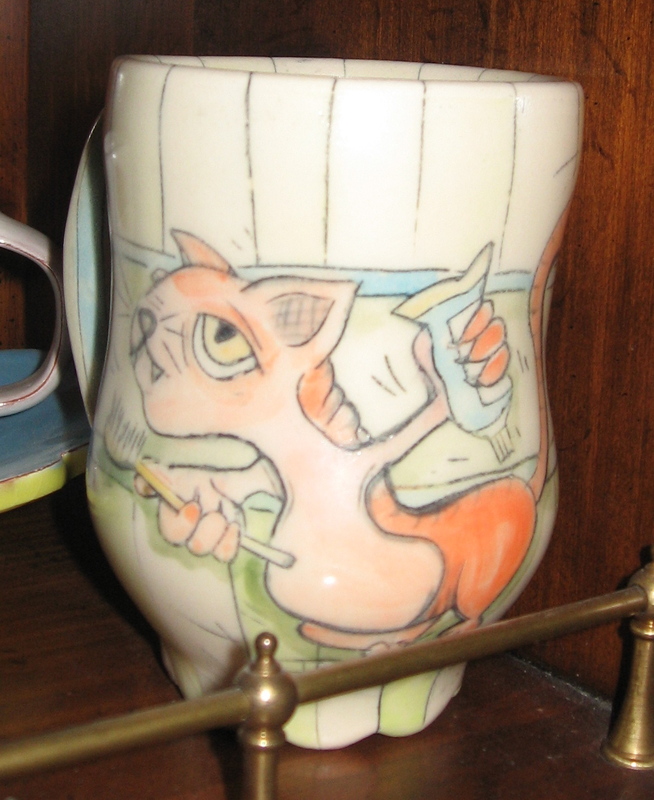 A wrinkly orange kitty, bright colors, and humor attracted me to this piece from a sweet and wonderful potter. The text “Freshen Up” inscribed on the handle makes me want to brush my teeth and drink orange juice from it just to be perverse. Also, I do brush my cats’ teeth, which seems pretty strange to me as a general rule. Brooke Noble’s sizable Buck Up mug. I admit to already having a tumbler by Ms. Noble, with vertical lozenges of varying pattern and equine silhouettes, but I couldn’t pass up this antlered face. I found two of my favorites from the handful of re-visits during submission in the cup sale early Friday morning: a cohort and I had lined up an hour early hoping to find at least some of the ones we had our eye on. 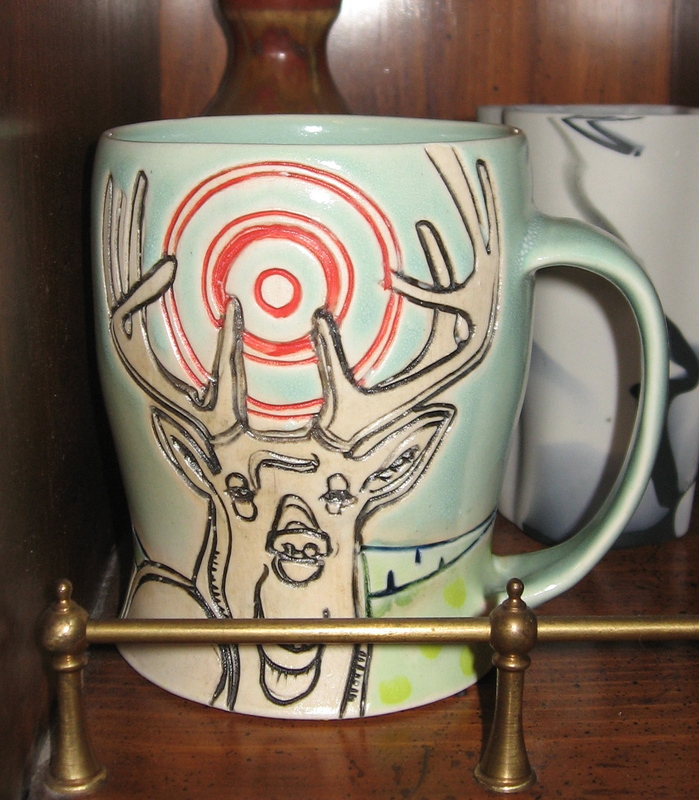 It’s a beefy mug featuring a buck and bulls-eye on this side with a smaller spotted fawn on the reverse and the text “Buck Up” on the bottom. Definitely a super-sleepy morning kind of vessel suitable for a serious dose of caffeine. 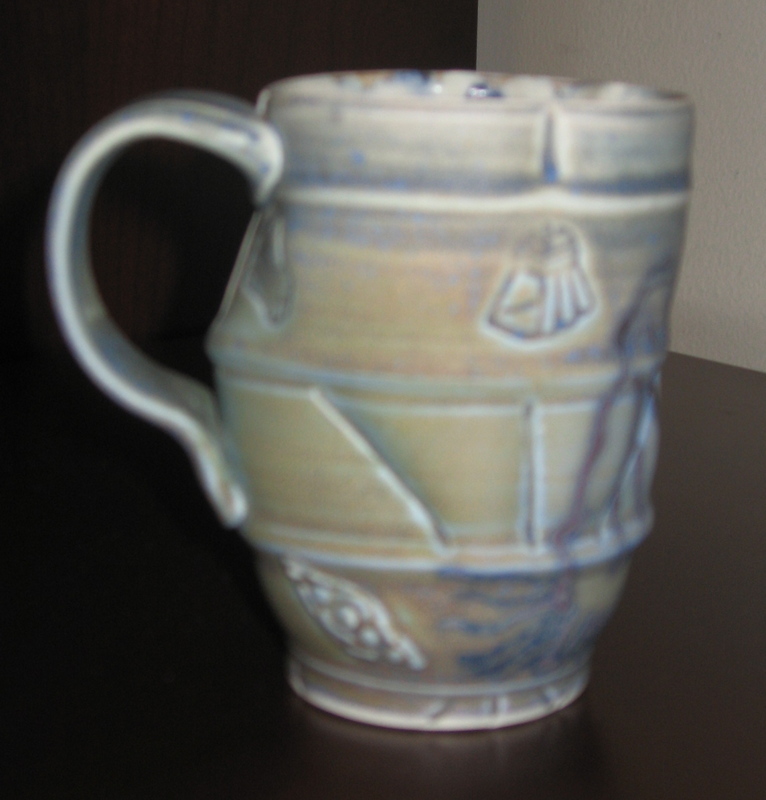 My final NCECA purchase, a Nicole Aquillano house mug. 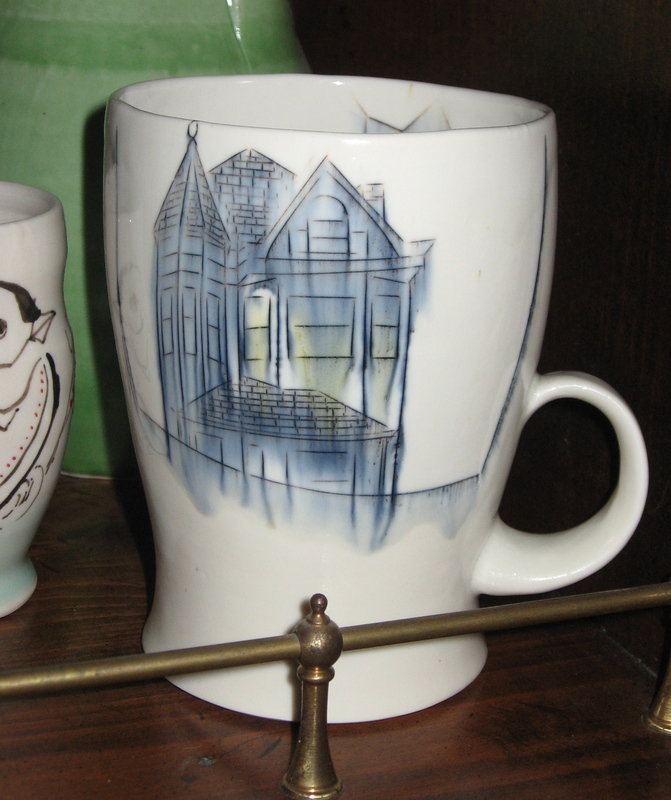 Part of the beauty of this mug shows clearly in the photo, but one angle cannot encompass the stairwell inscribed within or the house silhouette on the opposite side. The entire porcelain vessel glows with translucence and I find myself surprised that it took me so long to discover this stellar artist. I first saw a plate of her’s with a house drawing on Crimson Laurel Gallery’s website and without any prompting immediately understood and felt an attraction to the work. As I was checking out at the cup sale one of the wrappers informed me that one of her submissions won a Cups of Merit award, which hardly surprises me. Next time I’ll begin rattling off gallery and demonstration images. I also need to backtrack and cover my gallery show from February. Sorry I’ve been out of the loop with blog posts lately: I’ve been distracted by the NCECA trip and trying to get my bricks in a row for the soda kiln! More on all of that to come, so stay tuned. Forrest tidying up a minaret jar. My photographs turned out awful so forgive me for that. Forrest Lesch-Middelton visited Collin College in Plano in October, 2012 and I attended the 2nd day of his free demonstration. 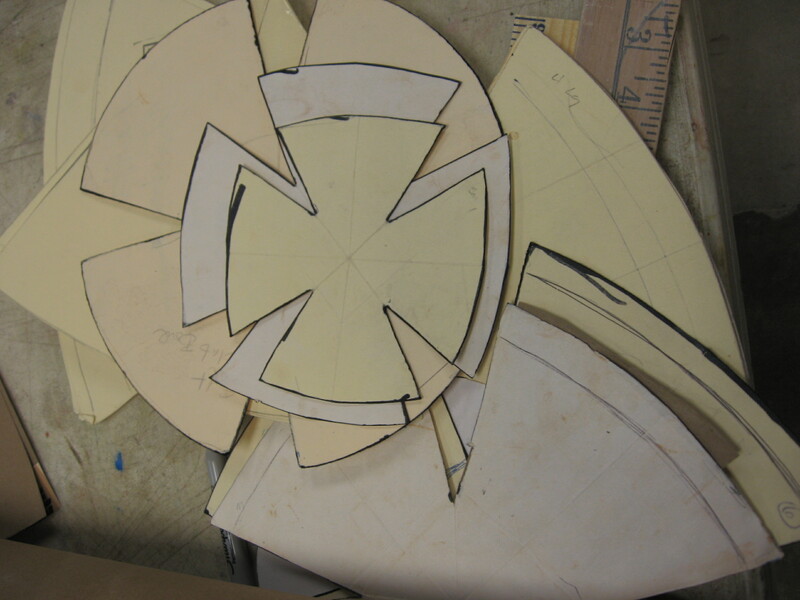 He broke down his decal making and applying processes, since most of the throwing had to be completed the previous day. 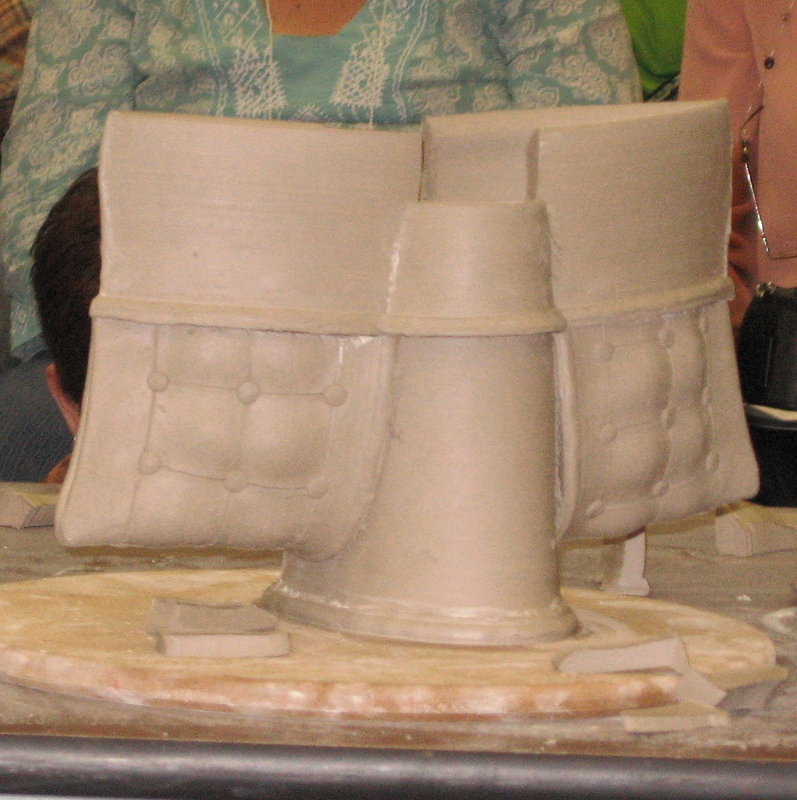 Multi-section assembly builds up the minaret jar, shown above on the wheel and below finished on the work table. 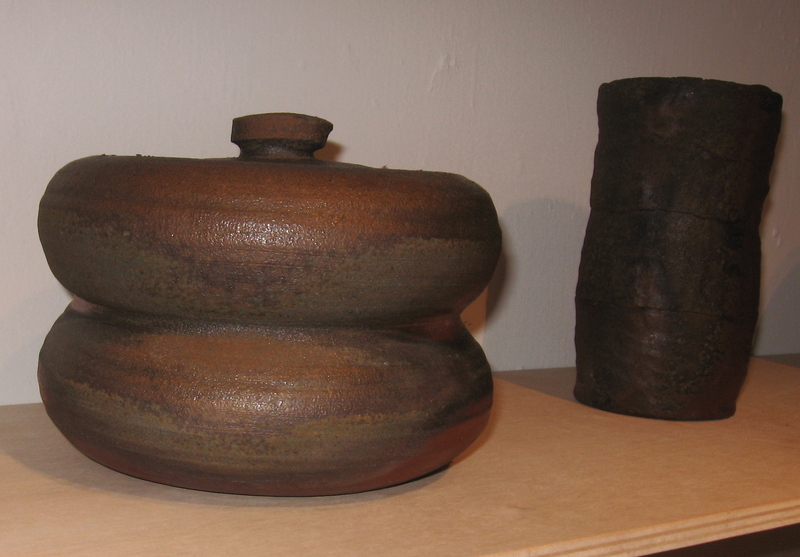 I love the way the raw clay still looks so much like the finished pots, so luscious and rich in hue. I’m definitely guilty of spending good money on a few of his pieces. Forrest layers his own decal papers using white and brown slip. The colors must be laid down in reverse, so the darker pattern lines show on the exterior. Applying the decals resembles putting on a fake tattoo: wetting down the backside of the paper until the slip decal releases onto the surface of the pot. In parting, Forrest trimming a foot. Thank you to Chris Gray for hosting and Forrest for demonstrating!